​( 985 ) -532 - 5817 and tell me which ones you are interested in . All carvings are done by myself unless stated as someone else . 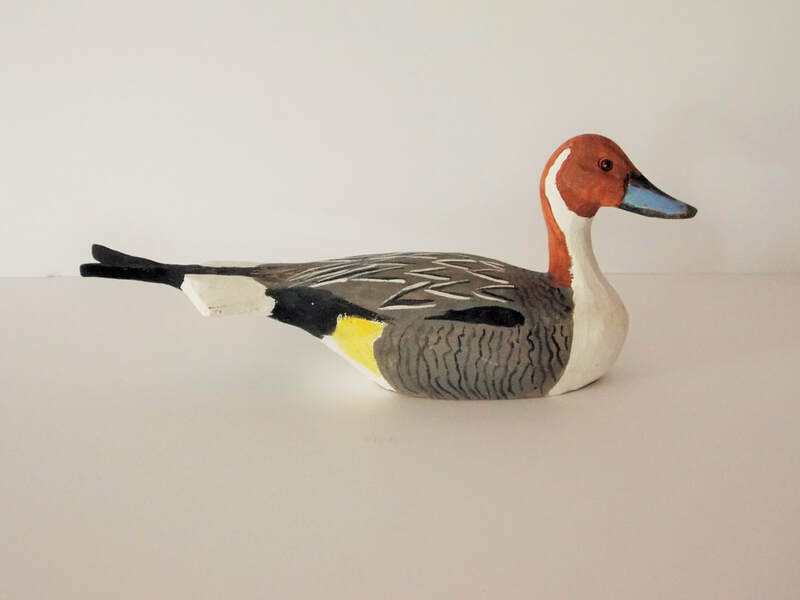 For your convenience there is a Click here to buy it now button under each carving and if you purchase more than one carving , shipping will be combined in one order to save you even more . 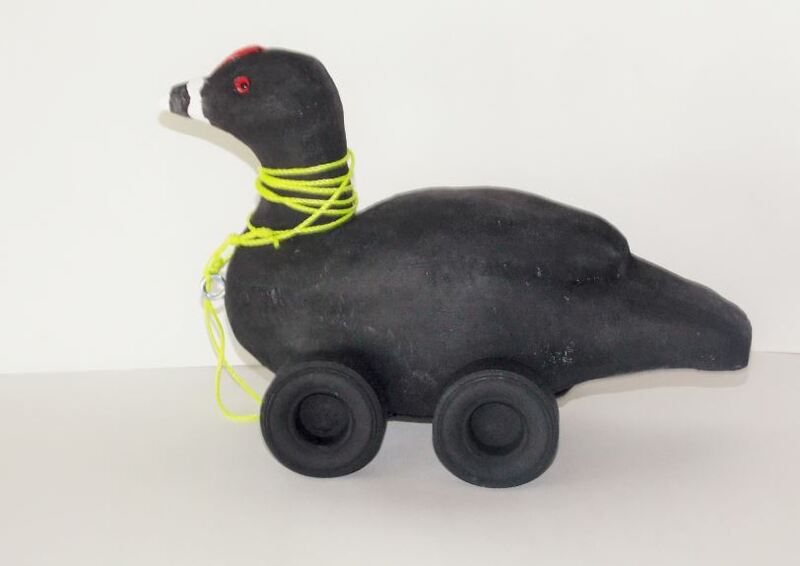 can also be carved and put it with white wall tires. 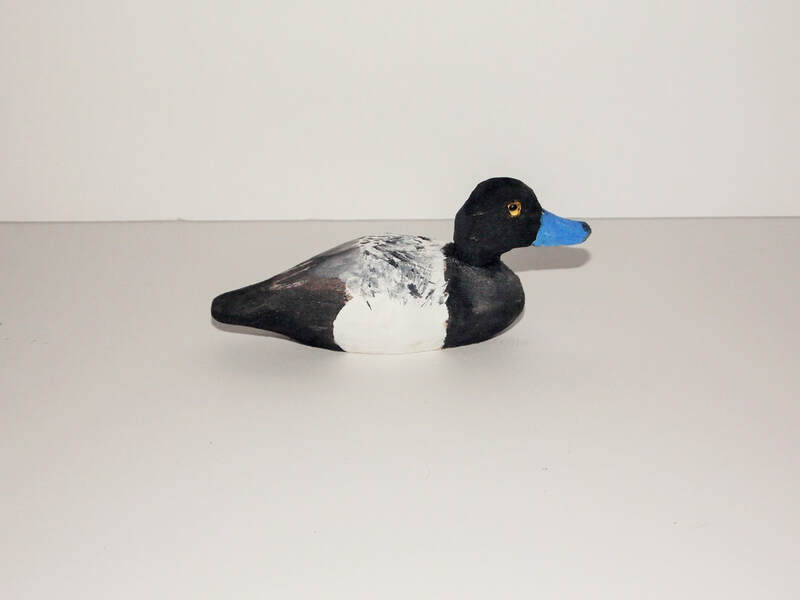 Kids will have a blast playing with their first decoy collection . 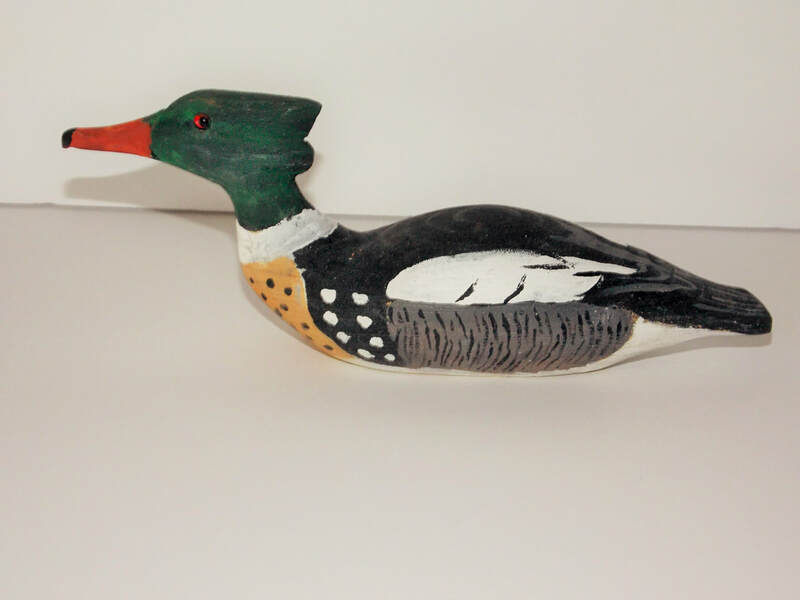 Carving is 13 1/4 inches long - 4 1/2 inches wide - 6 inches high . Tail is made with pvc pipe making it more stronger than in wood . Carved out of tupelo and painted in acrylics . ​Carving is 11 inches long - 4 inches wide - 6 inches high . 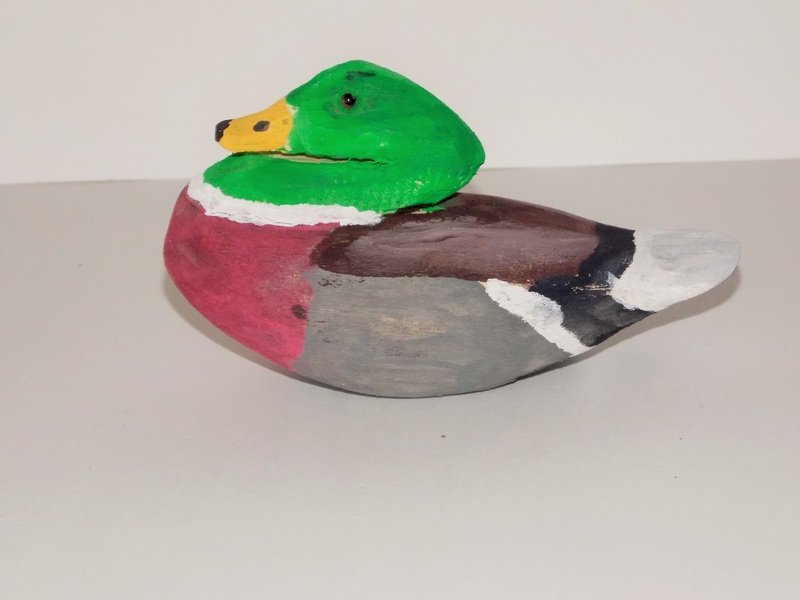 Carved out of Balsa and painted in acrylics . 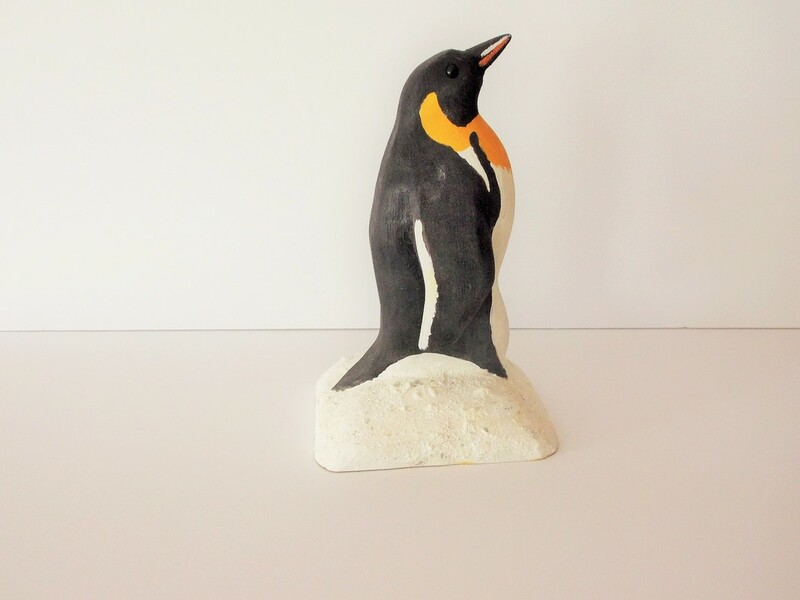 Measures 12 inches long - 7 1/2 inches wide - 4 inches high. 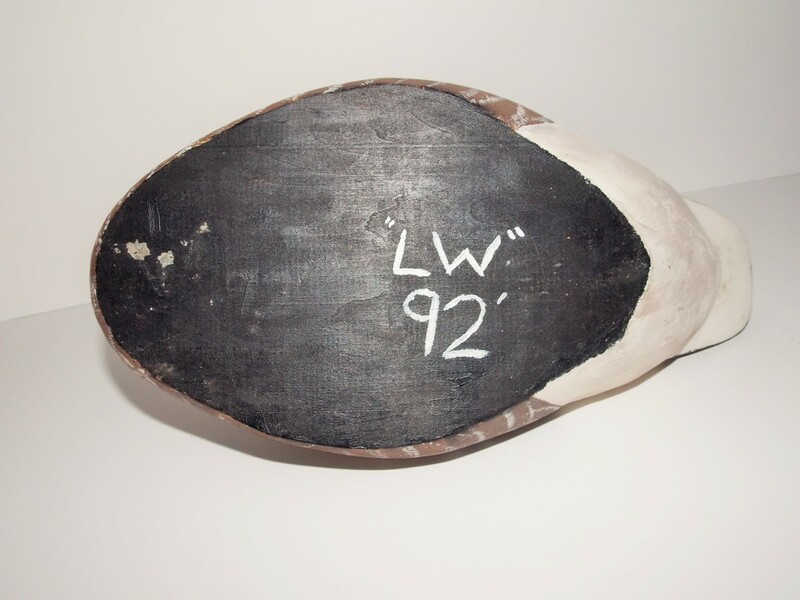 Carver unknown but has JR cut out in the heel of the shoe and has a few pieces of leather in a couple of the holes in the shoe . 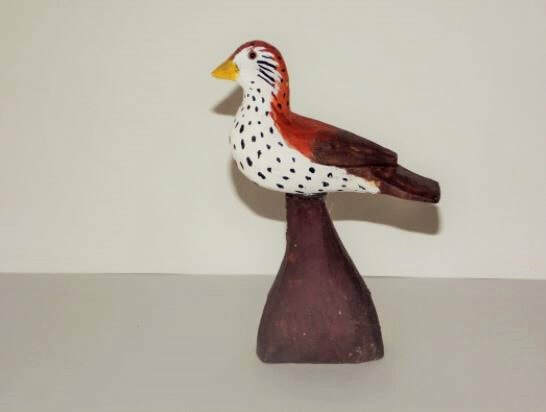 ​Carving measures 11 3/4 inches long - 3 1/4 inches wide - 5 1/4 inches high . 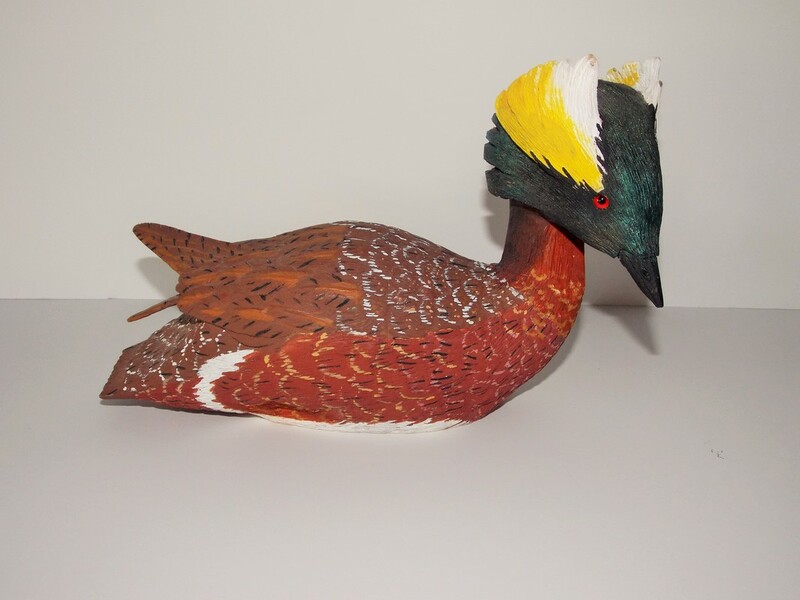 Carved out of tupelo - decorative carving with inserted wings and crest on head flared out and painted in acrylics . Carving measures 13 inches long - 3 3/4 inches wide - 4 1/2 inches high . Carving measures 16 inches long - 5 1/2 inches wide - 7 inches high . 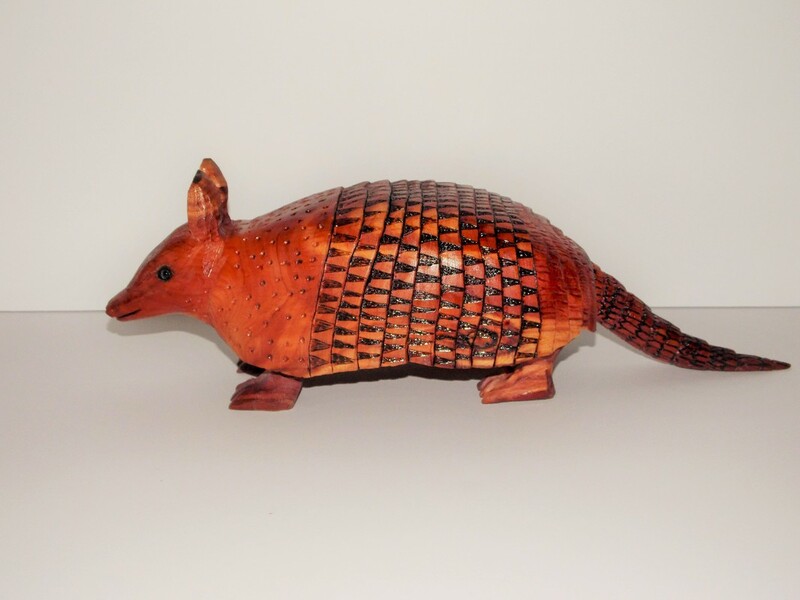 Carved in Cedar and varnished , was entered in the 2017 Cajun Heritage Festival Placed 1st place best of show with a 1st place best of show ribbon and medallion . Carving measures 15 1/4 inches long - 5 inches wide - 5 inches high . 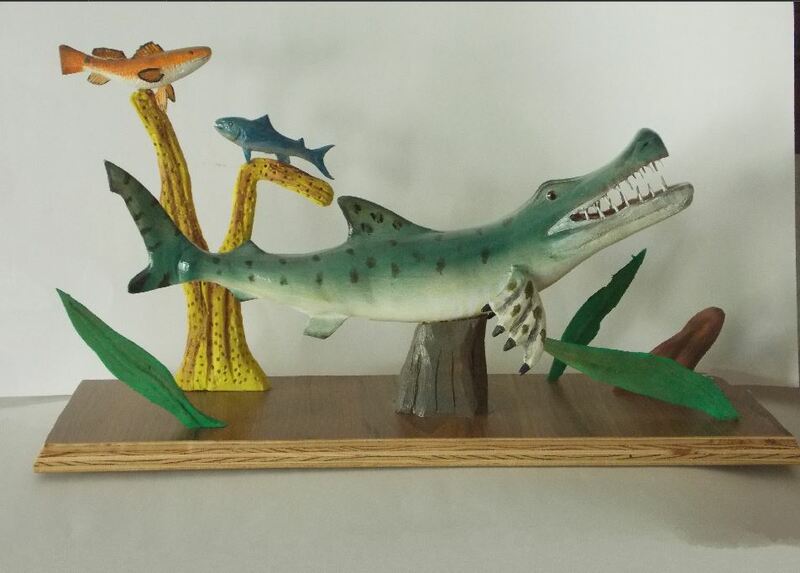 Hand carved Croc-a-shark with sharp teeth and small bluefish and red fish in the background Truly one of a kind . tell your friends you raise them in your back pond . Carving measures 8 3/4 inches long - 6 inches wide - 7 inches high with grass . 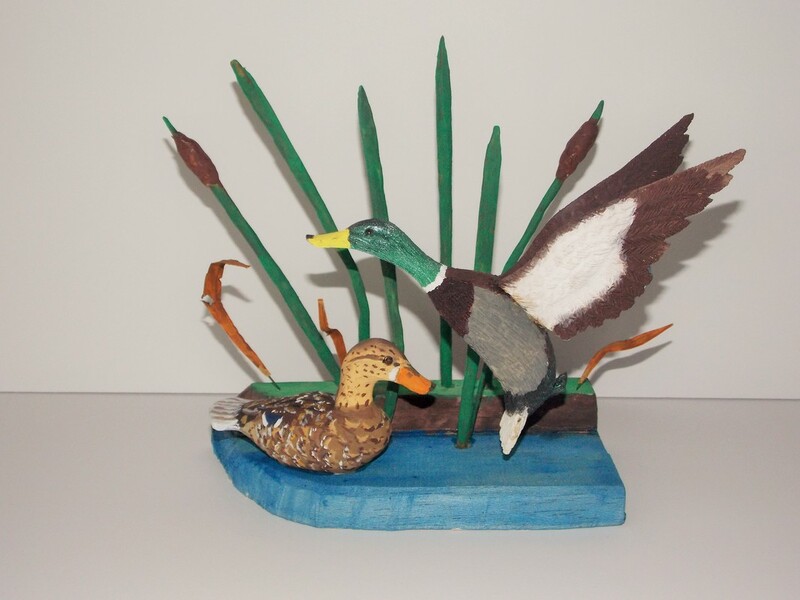 Mallard drake measures 5 inches long - 3 inches wide with open winds - 5 1/2 inches high - mallard hen measures 4 1/4 inches long - 1 3/4 inches wide - 2 1/2 inches high with cat tails and grass in background . 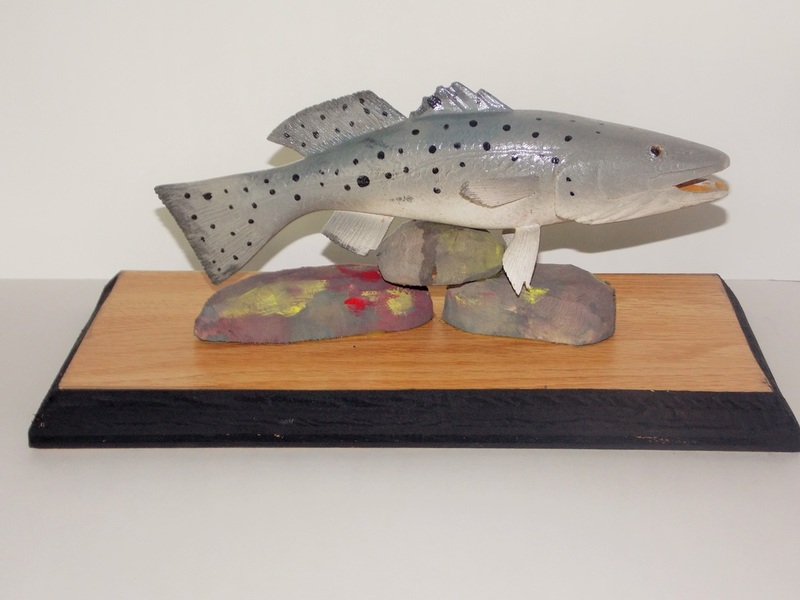 Miniature Dolphin carved out of tupelo and painted in acrylics . Carving measures 4 inches long - 4 inches wide - 4 1/2 inches high . Carving measures 8 inches high - 4 1/4 inches wide - 4 1/2 inches long . Carving measures 9 1/2 inches long - 6 inches wide - 7 inches high . Carving measures 11 inches long - 3 inches wide - 18 inches high . Beautiful detailed work that was done on this carving . 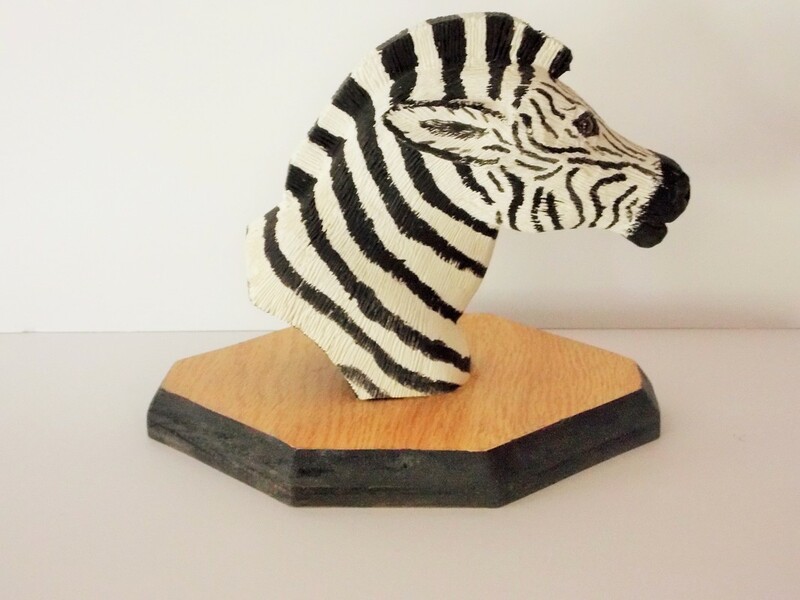 Hand carved zebra head carved out of tupelo and painted in acrylics . Carving measures 8 inches long - 6 1/2 inches wide - 6 inches long . 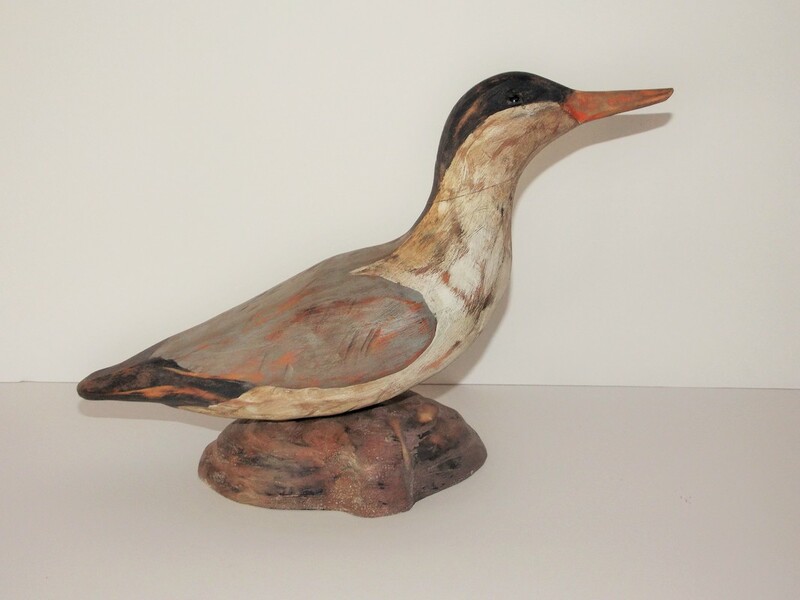 Antiqued Tern sitting on a carved clam shell . Carving measures 10 inches long - 4 1/2 inches wide - 6 1/2 inches high . 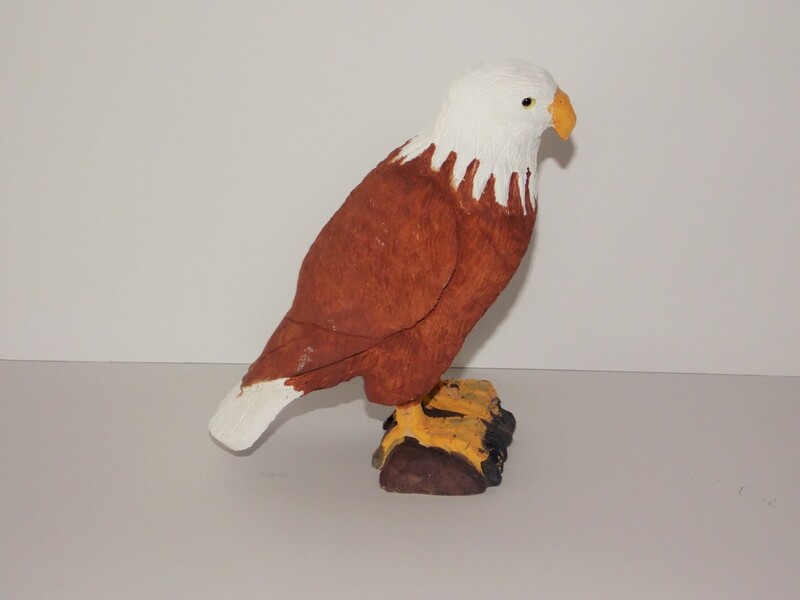 Bald Eagle on a branch carved in tupelo and painted in acrylics . Carving measures 5 1/4 inches long - 3 inches wide - 5 1/2 inches high . 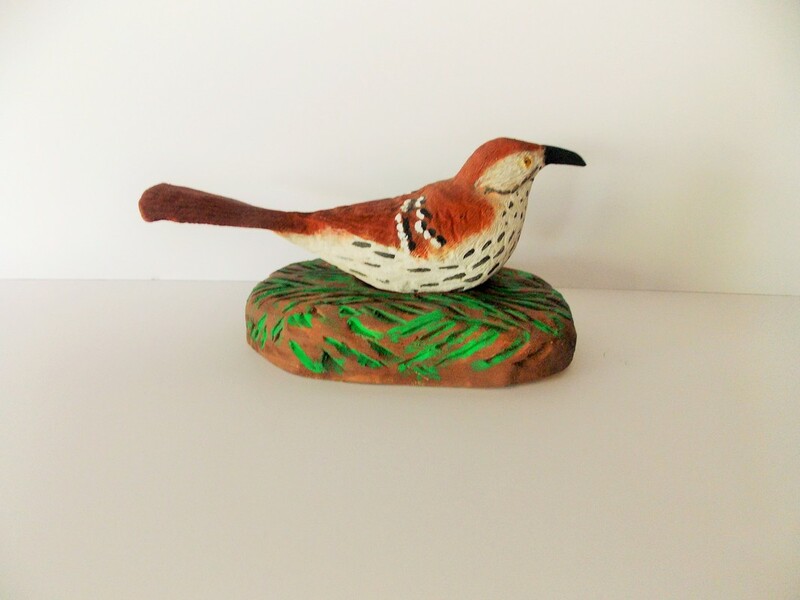 Brown Thrasher in nest carved out of tupelo and painted in acrylics . Carving measures 9 1/2 inches long - 5 inches wide - 4 1/4 inches high . 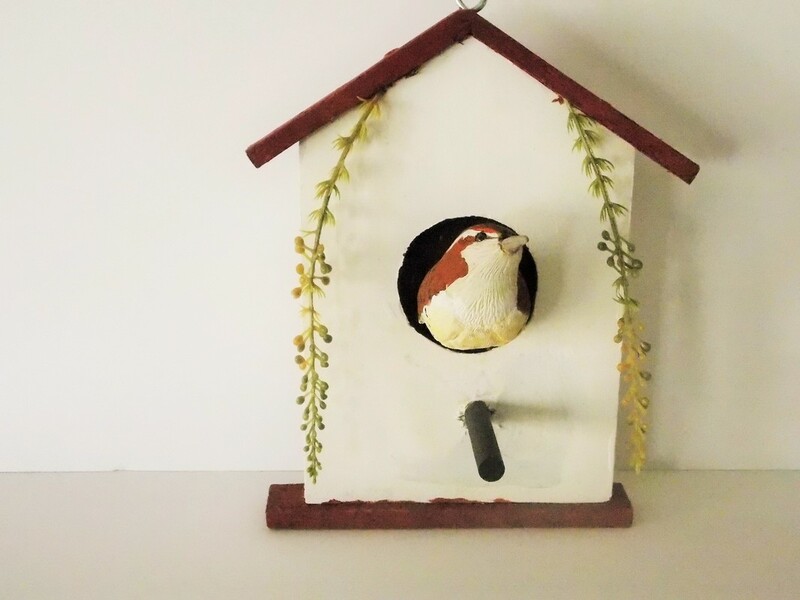 Carolina Wren with the look of having a bird house with the wren looking out . 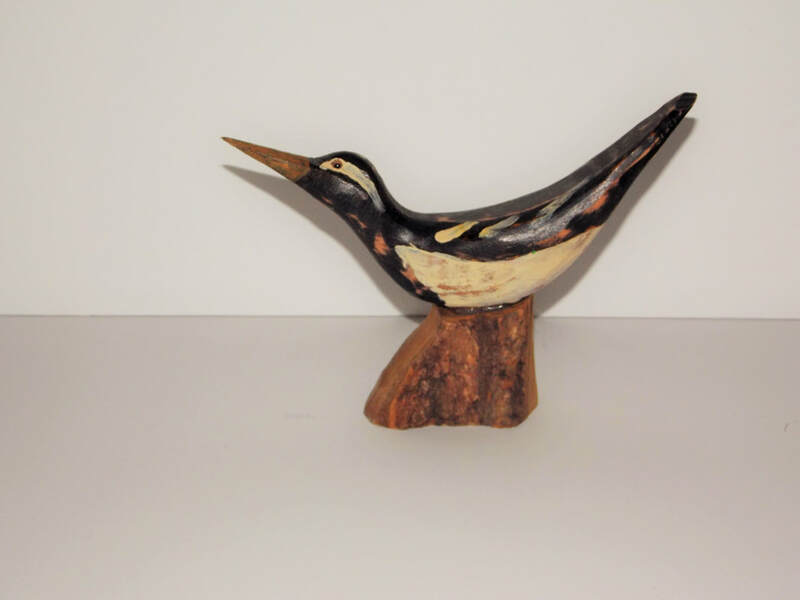 Wren measures 6 1/2 inches long - 3 inches wide - 8 inches high . 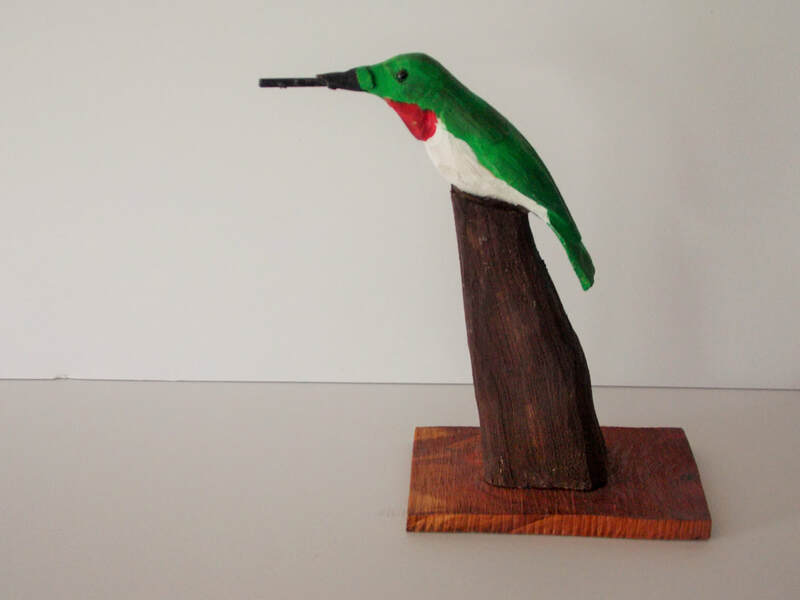 Hummingbird is carved out of tupelo and painted in acrylics . Carving measures 4 1/2 inches long - 1 inch wide 6 inches high with stand . Carving measures 3 3/4 inches long - 2 inches wide - 4 inches high . 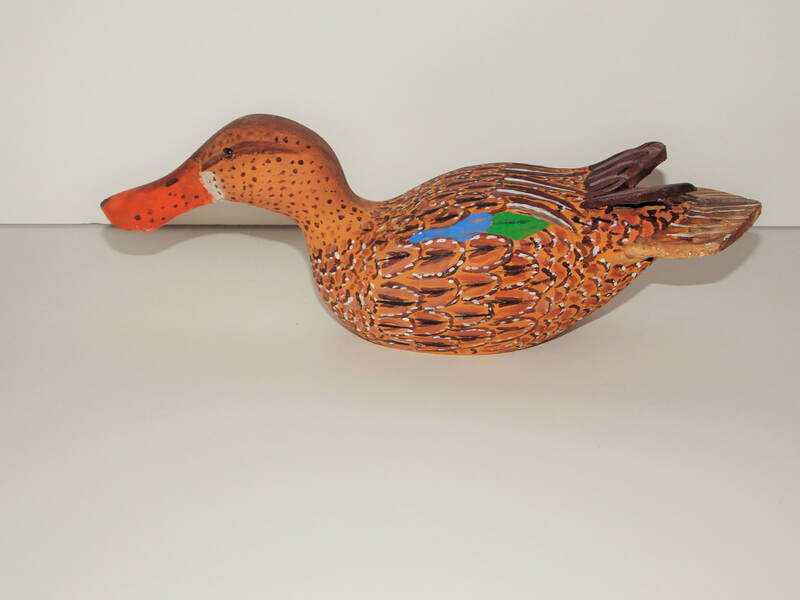 Carving is a slick carved out of tupelo and painted in acrylics . Carving measures 6 inches long - 2 inches wide - 6 inches high . 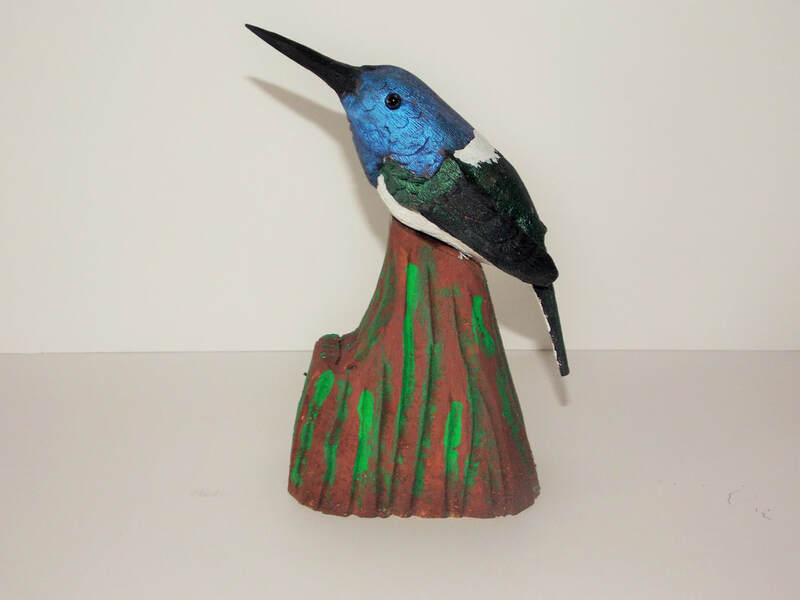 The white-necked jacobin (Florisuga mellivora) is a large and attractive hummingbird that ranges from Mexico, south to Peru, Bolivia and south Brazil. Carving measures 4 inches long - 2 inches wide - 5 3/4 inches high with stand . 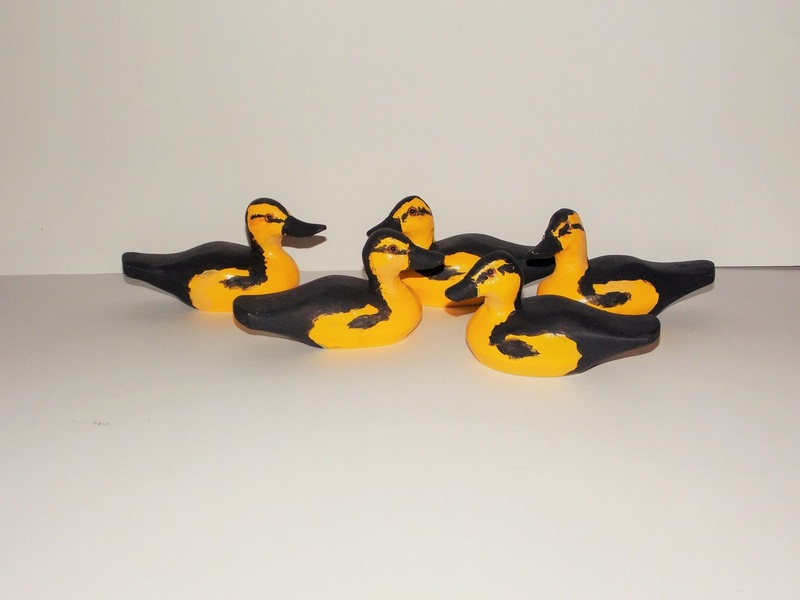 Miniature decorative Wigeon carved out of tupelo and painted in acrylics . 3 inches wide with stand . 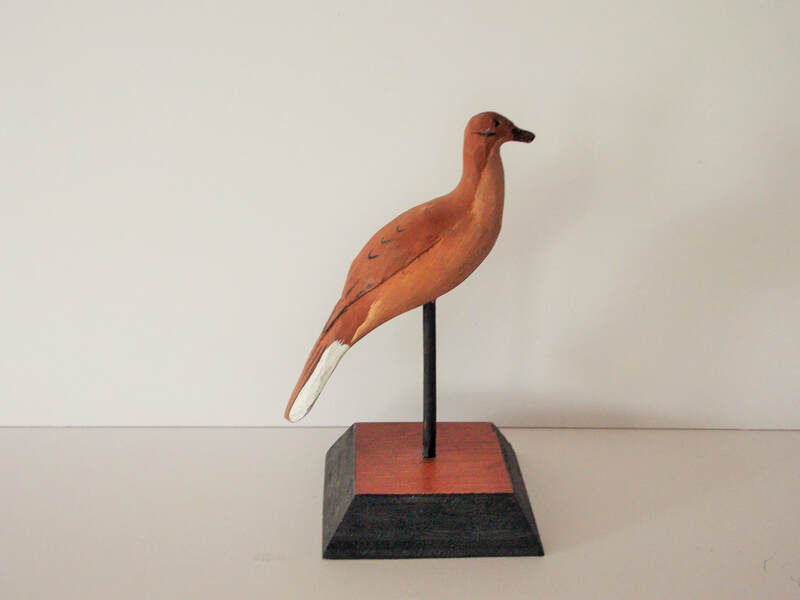 Mourning Dove is carved in tupelo and painted in acrylics . Carving measures 10 1/2 inches long - 3 1/2 inches wide - 10 inches high with stand . 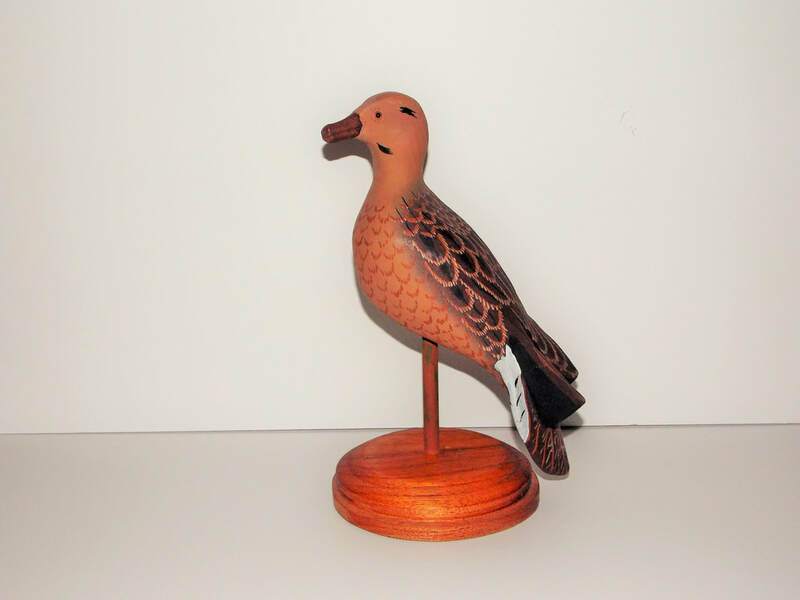 Miniature mourning dove is carved out of tupelo and painted in acrylics . Carving measures 5 inches long - 1 1/4 inches wide - 5 3/4 inches high with stand . 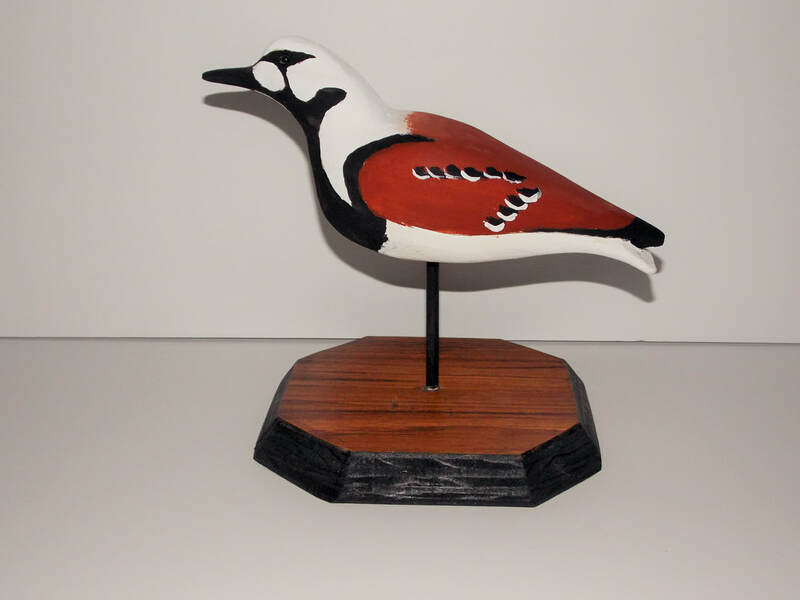 ​The song bird carvings below are smaller and if you want a certain bird carving in this size just email me at decoys@viscom.net . 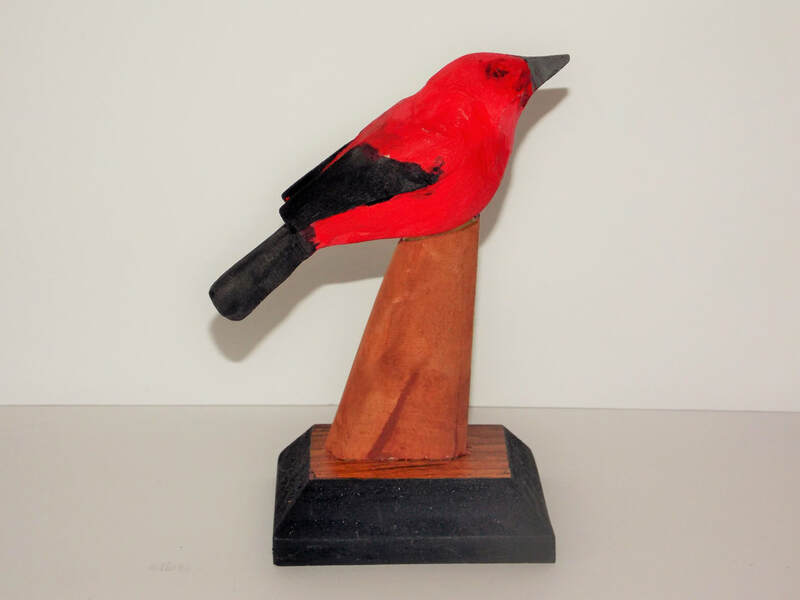 Scarlet Tanager slick carved out of tupelo and painted in acrylics . 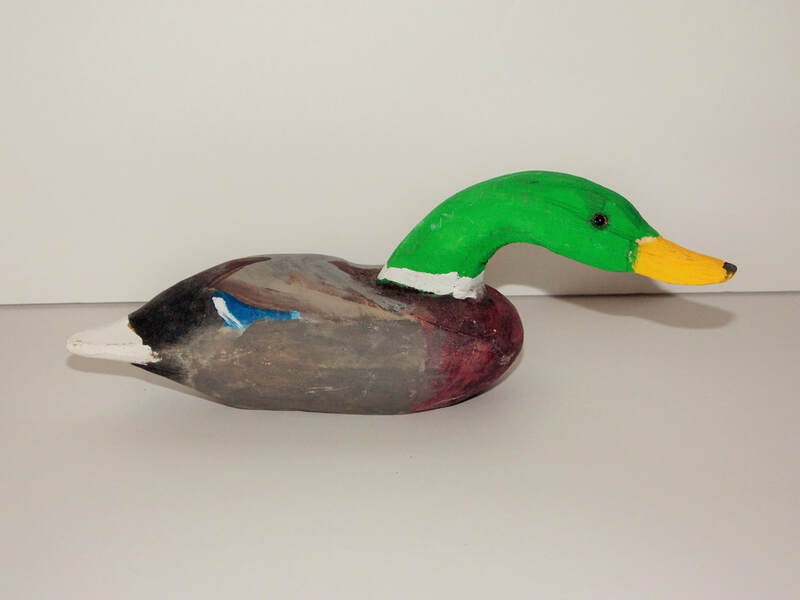 Carving is 4 inches long - 2 inches wide - 5 inches high with stand . 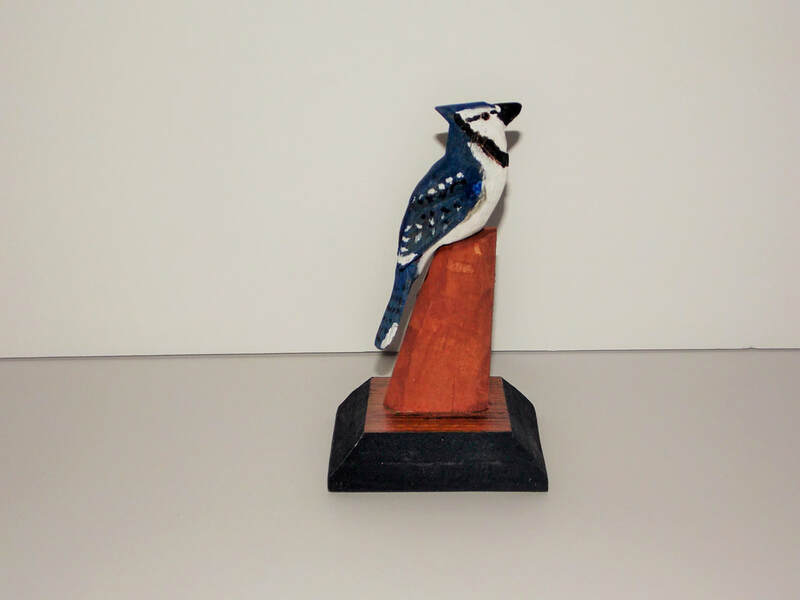 Miniature Bluejay slick carved out of tupelo and painted in acrylics . 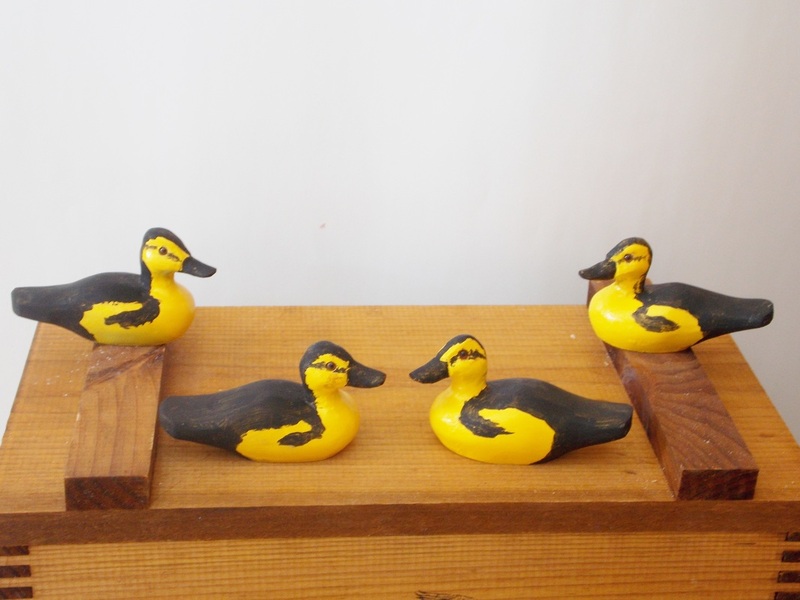 Carving measures 4 inches long - 1 1/2 inches wide - 5 inches high with stand . 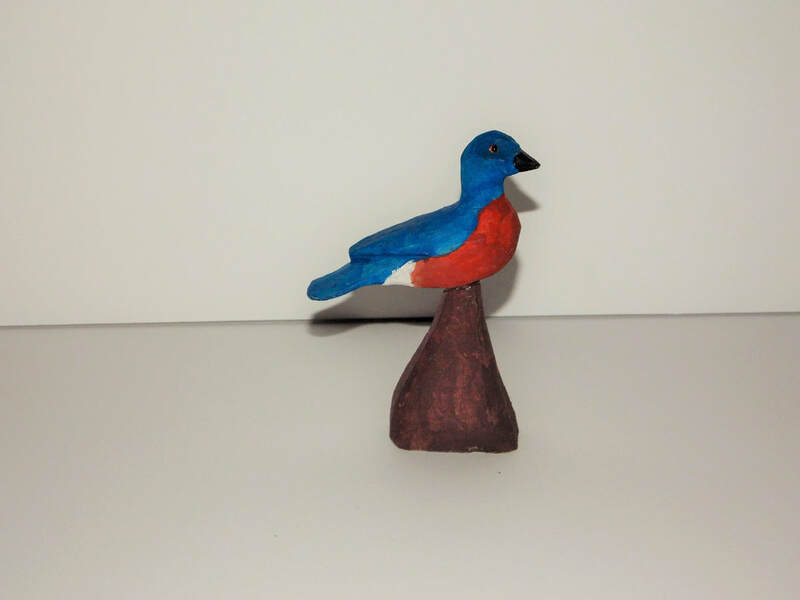 Miniature Bluebird carved in tupelo and painted in acrylics . 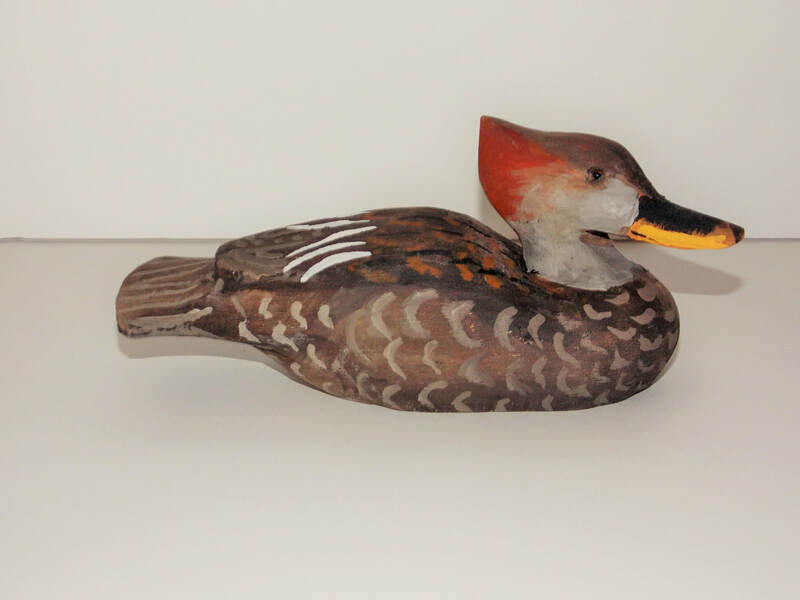 Carving measures 4 1/2 inches long - 1 1/4 inches wide - 5 1/2 inches high with stand . 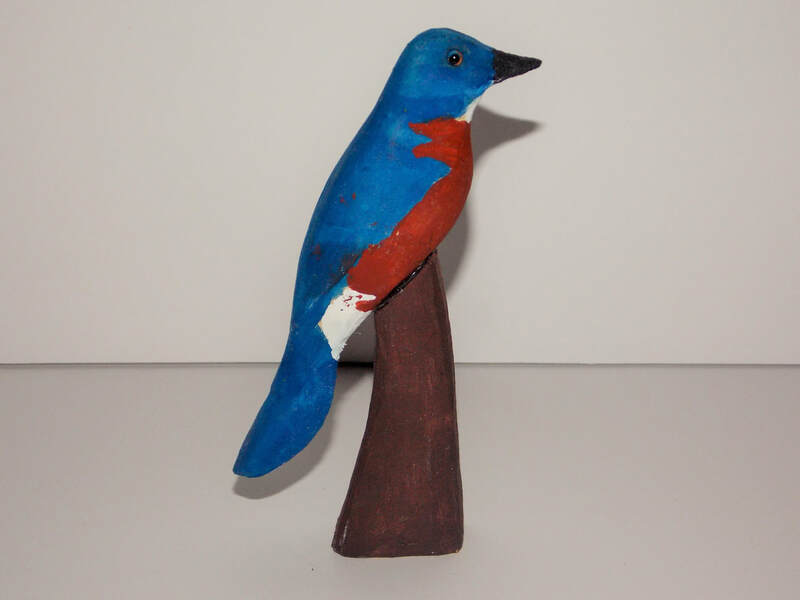 Miniature Bluebird carved out of tupelo and painted in acrylics . Carving measures 3 inches long - 1 inch - wide - 4 inches high with stand . Miniature Hermit Thrush slick carved out of tupelo and painted in acrylics . Carving measures 3 inches long - 1 inch wide - 4 inches high with stand . 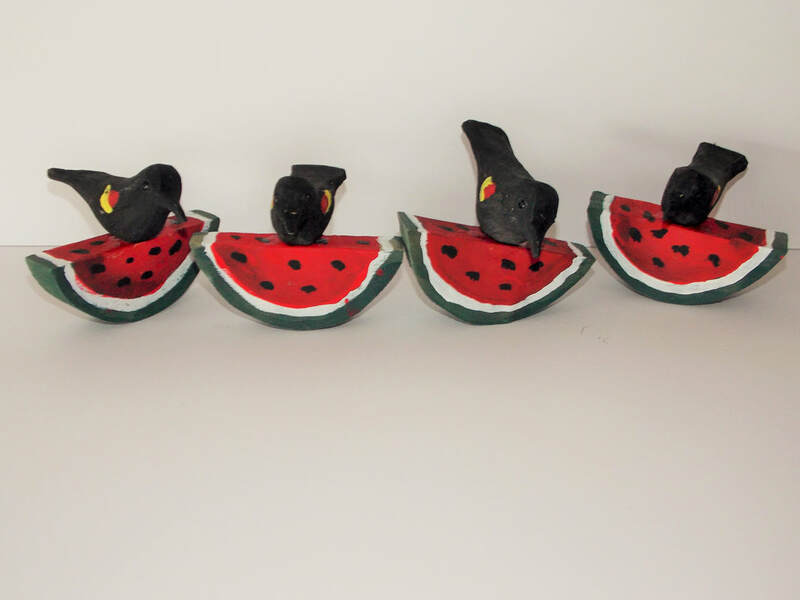 Miniature Red Wing Blackbirds feeding on a watermelon slice . 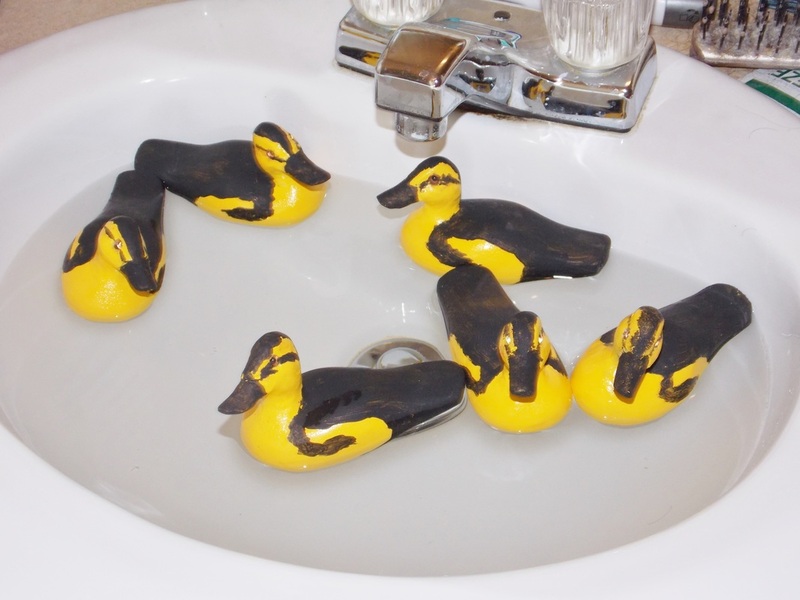 All four are carved out of tupelo and painted in acrylics . 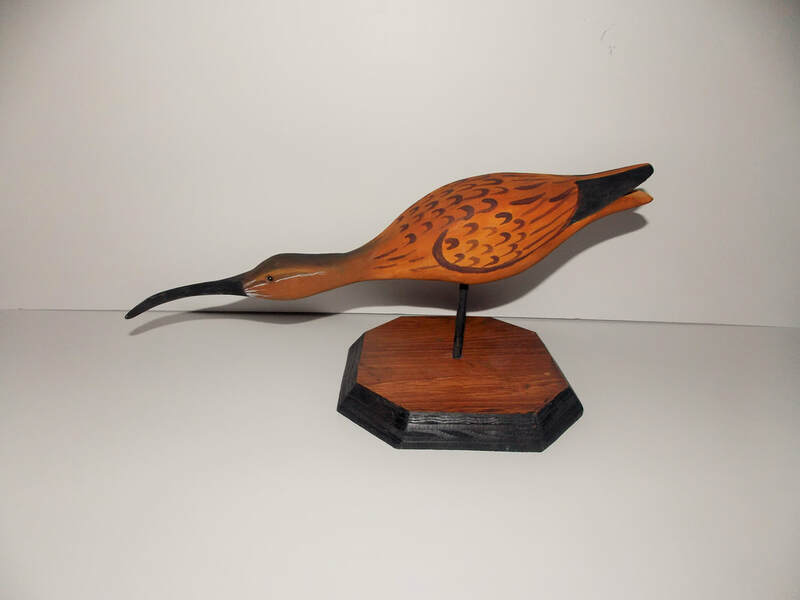 Bird Carvings measures 4 inches long - 1 inch wide - 3 inches high on stand . Watermelon slice measures 3 3/4 inches long - 1 inch wide -1 1/2 inches high. 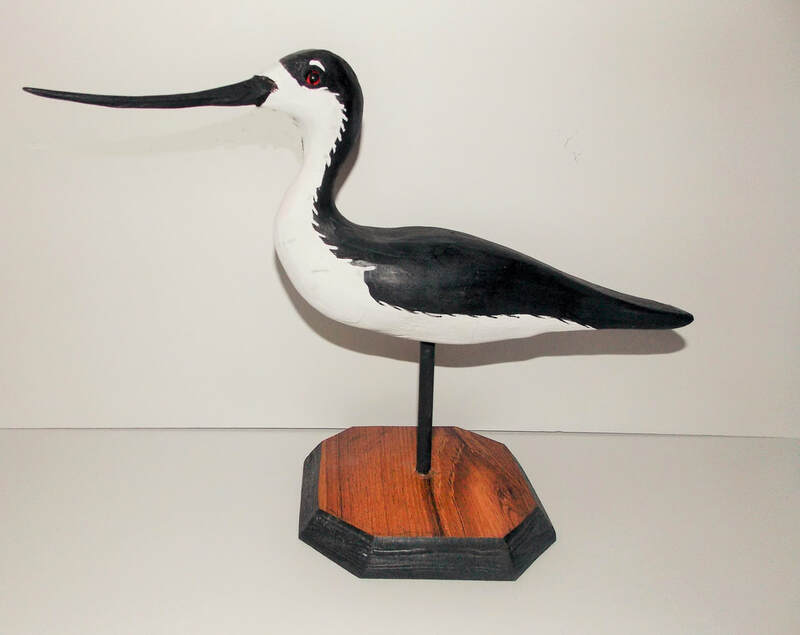 Black - neck Stilt carved out of tupelo and painted in acrylics . Carving measures 15 inches long - 3 1/4 inches wide - 11 inches high with stand . 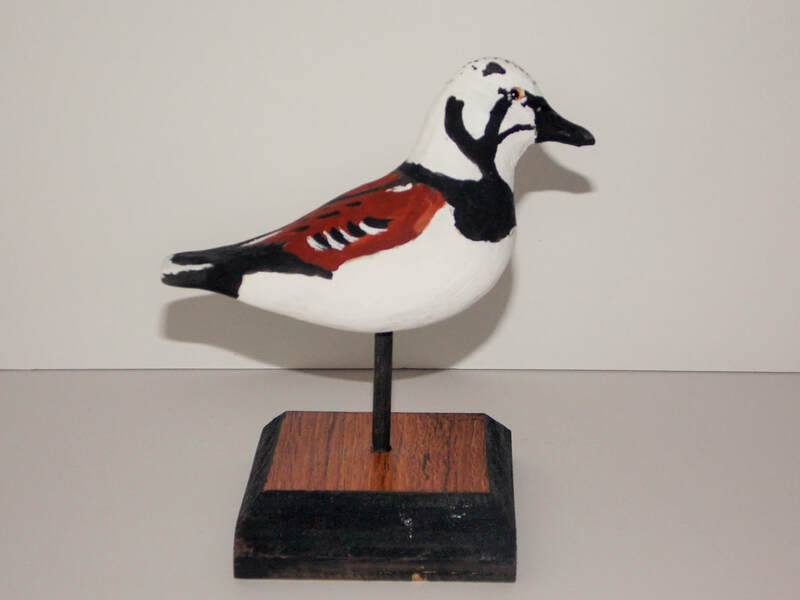 Ruddy Turnstone is carved out of tupelo and painted in acrylics . Carving measures 9 inches long - 3 inches wide - 7 1/4 inches high with stand . 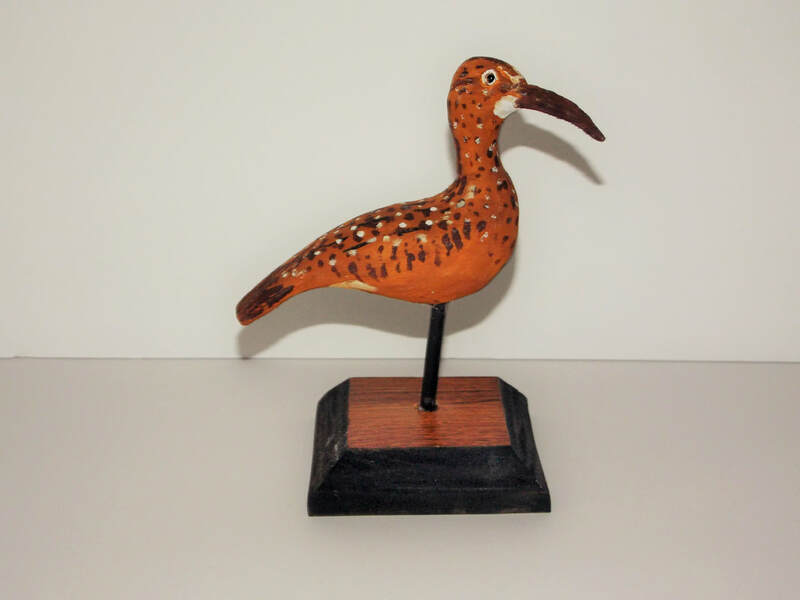 Curlew carved in feeding position carved out of tupelo and painted in acrylics . Carving measures 14 inches long - 2 1/2 inches wide - 6 inches high on stand . 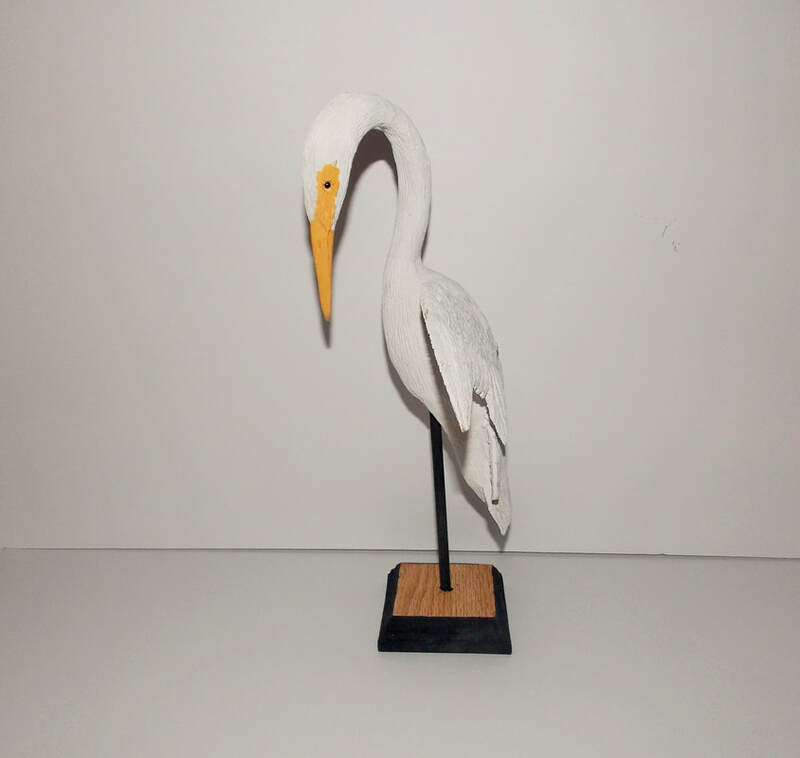 This preening Egret with one wing stretched out is carved out of tupelo and painted in acrylics . 12 inches high with stand . Great Blue Heron with grass in background . 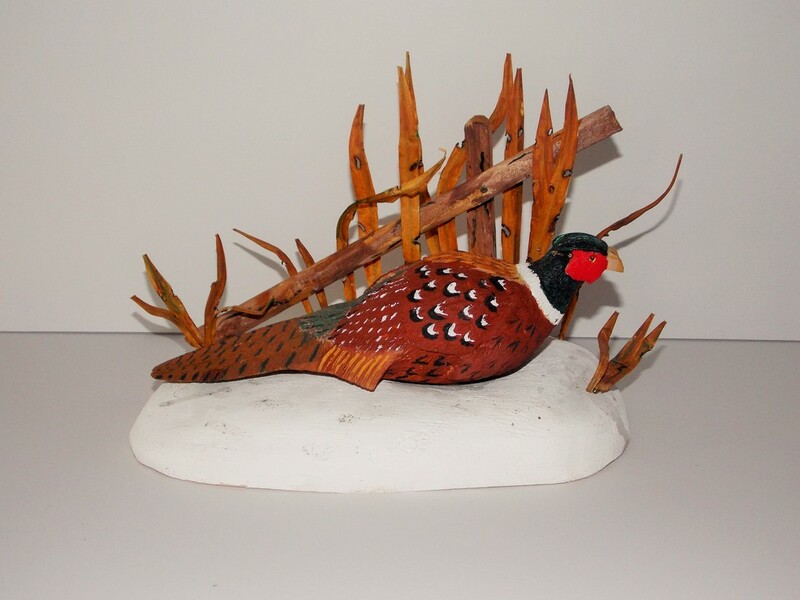 Carving measures 8 inches long - 2 inches wide - 13 1/2 inches high with grass on stand . 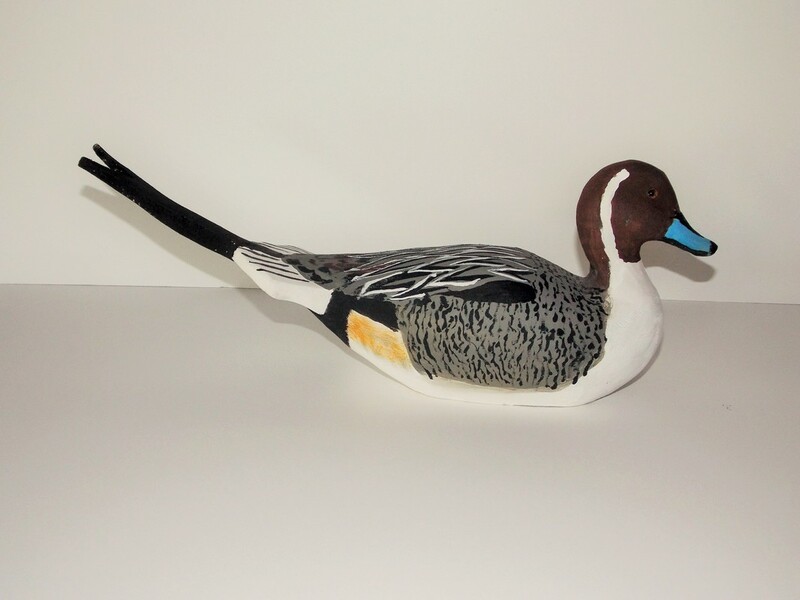 Preening shorebird carved out of tupelo and painted in acrylics . Carving measures 6 inches long - 2 1/4 inches wide - 7 inches high with stand . 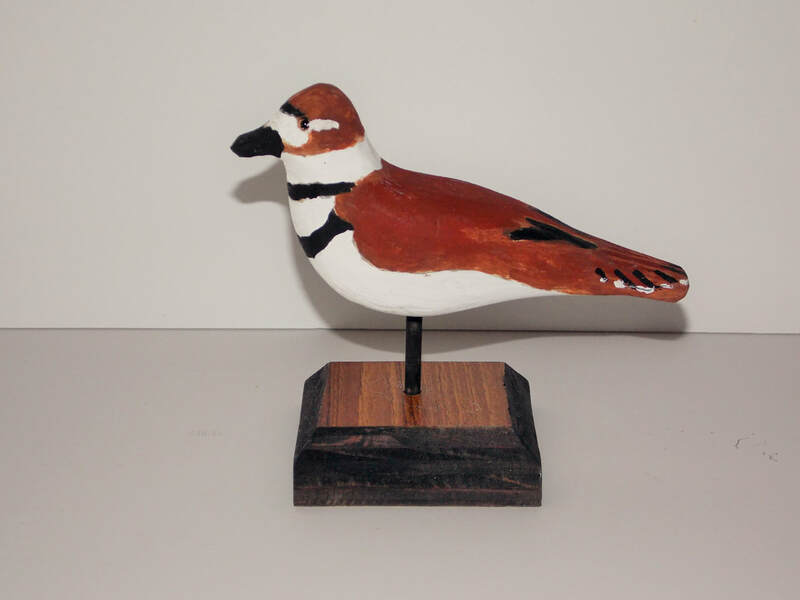 Miniature Killdeer carved out of tupelo and painted in acrylics . Carving measures 5 1/2 inches long - 1 1/2 wide - 4 1/2 inches high with stand . 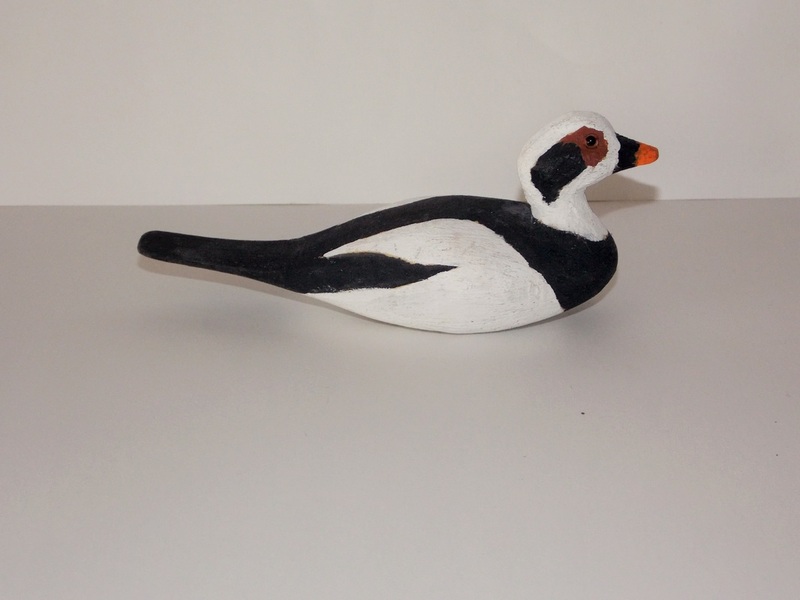 Miniature Ruddy Turnstone carved out of tupelo and painted in acrylics . 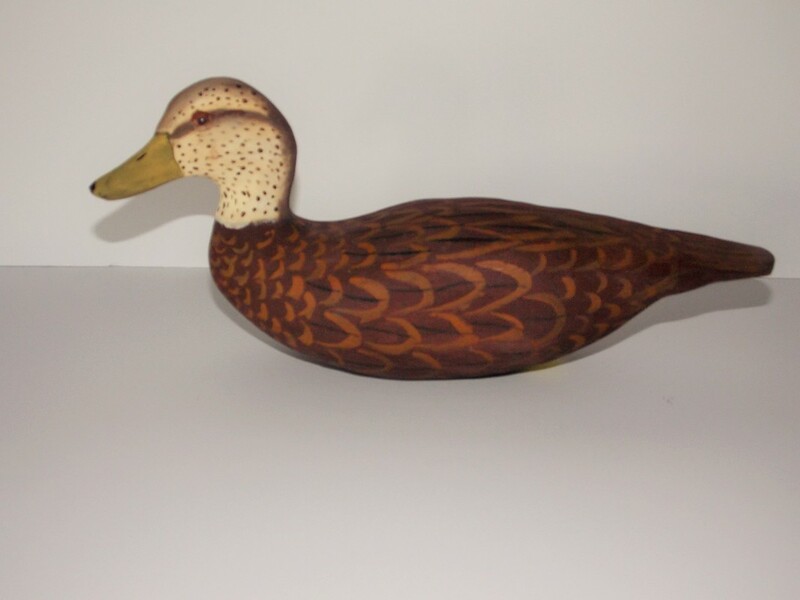 Carving measures 4 1/2 inches long - 1 1/2 inches wide - 5 inches high with stand . 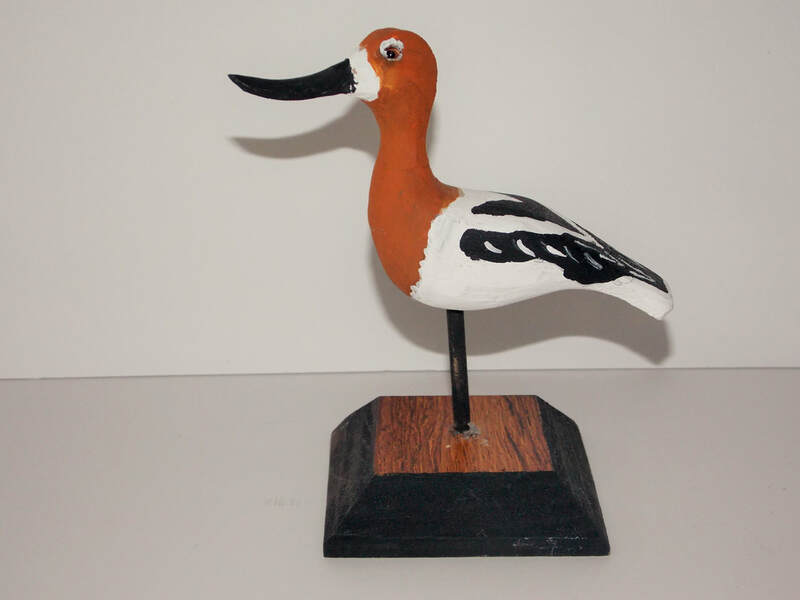 Minature shorebird is carved out of tupelo and painted in acrylics . Carving measures 5 1/4 inches long - 1 1/4 inches wide - 5 1/4 inches high with stand . 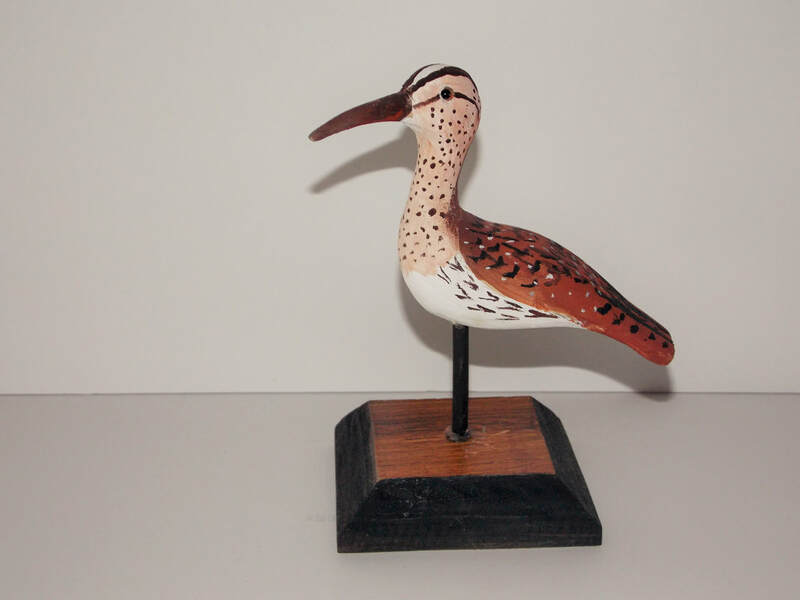 Miniature shorebird carved out of tupelo and painted in acrylics . 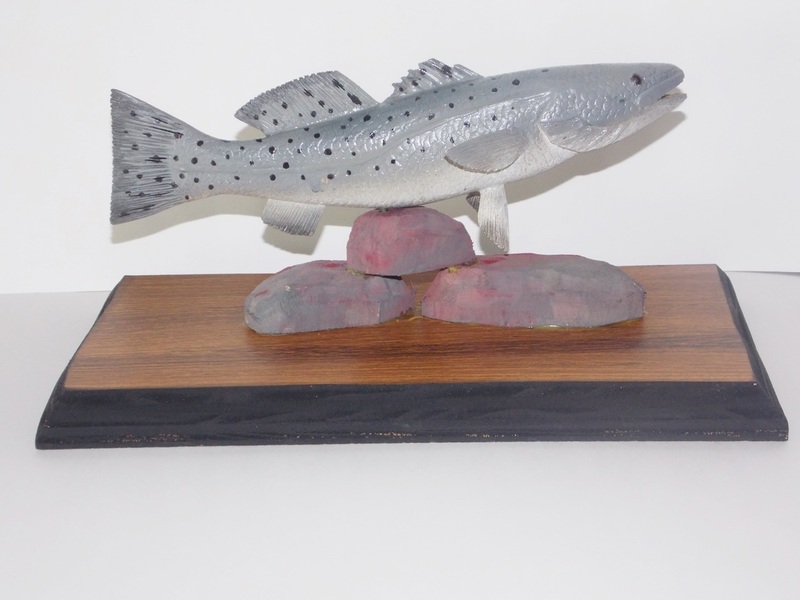 ​Carving measures 5 1/2 inches long - 1 1/4 inches wide - 5 1/4 inches high with stand . Carving measures 5 inches long - 1 1/4 inches wide - 5 1/2 inches high on stand . Carving measures 5 1/4 inches long - 1 1/4 inches wide - 5 inches high with stand . 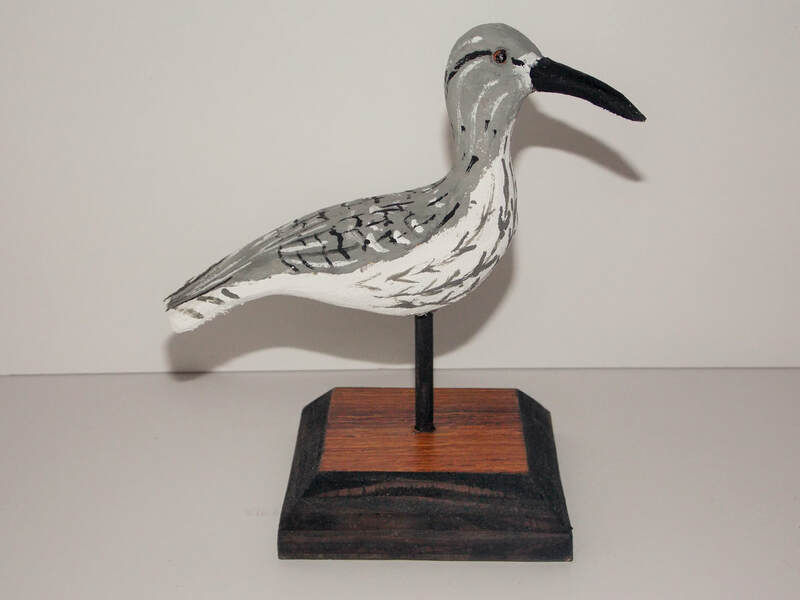 ​Miniature shorebird carved out of tupelo and painted in acrylics . 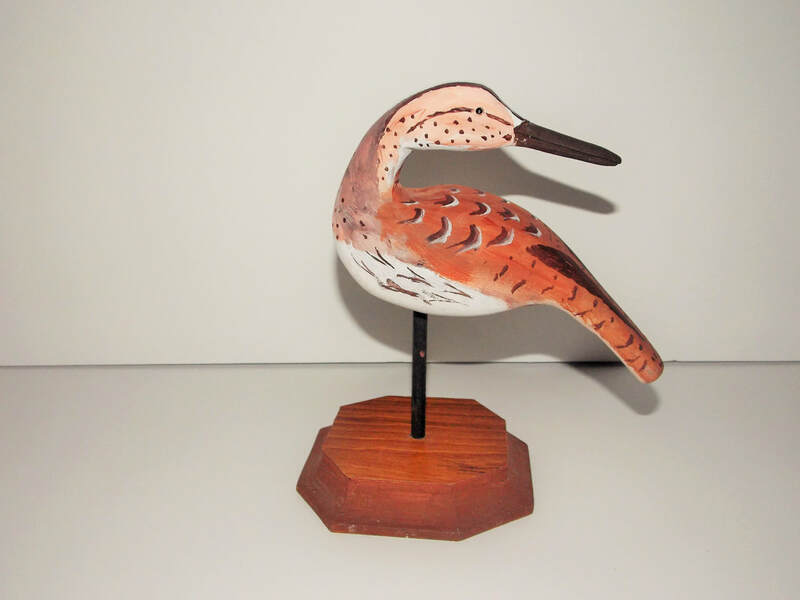 Miniature shorebird measures 5 3/4 inches long - 1 1/4 inches wide - 5 1/2 inches high with stand . Carving measures 6 1/2 inches long - 1 1/4 inches wide - 4 1/2 inches high on stand . 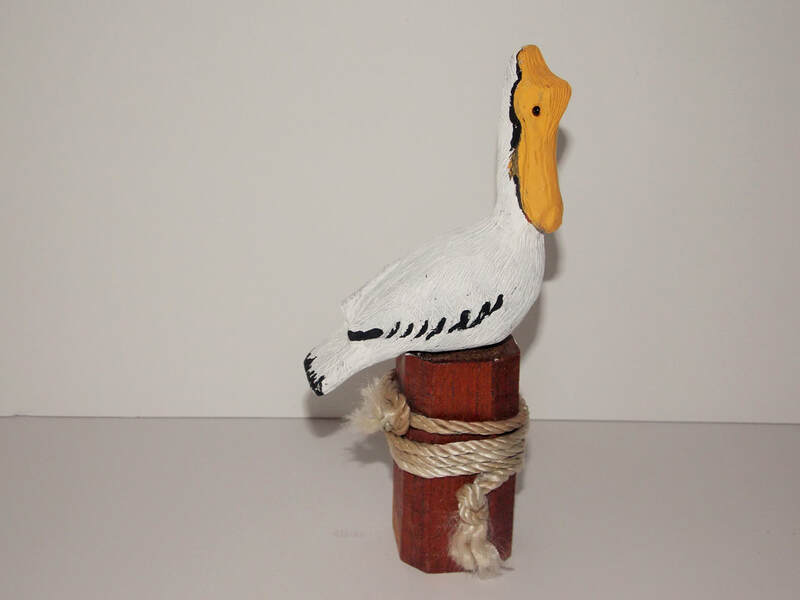 Miniature Pelican carved on Post and painted in acrylics . 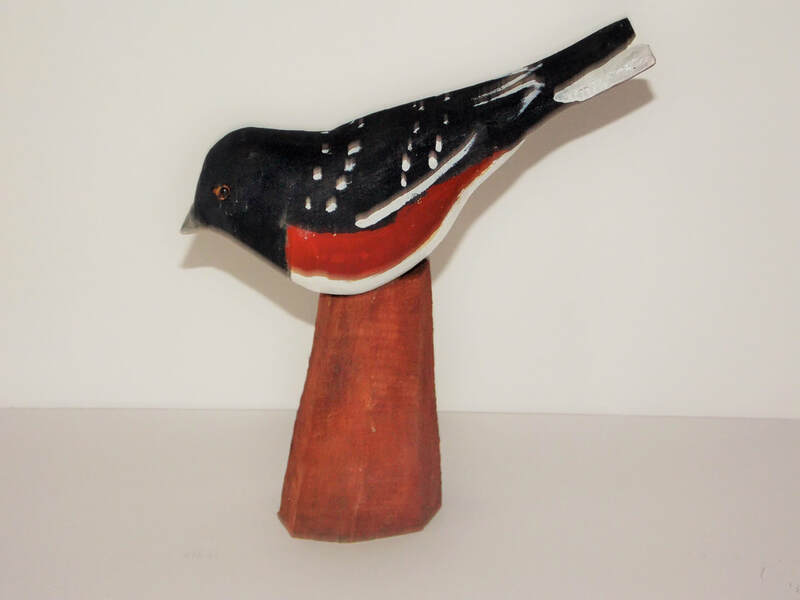 Carving measures 5 inches long - 1 1/2 inches wide - 6 1/4 inches high on stand . Carving measures 5 1/4 inches long - 1 1/2 inches wide - 6 3/4 inches high on stand . 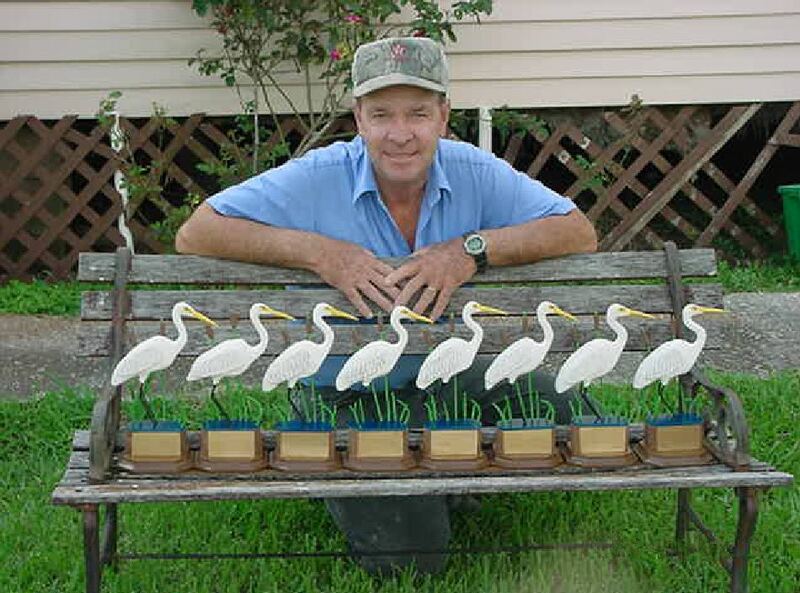 Miniature Green Herons carved out of tupelo and painted in acrylics . 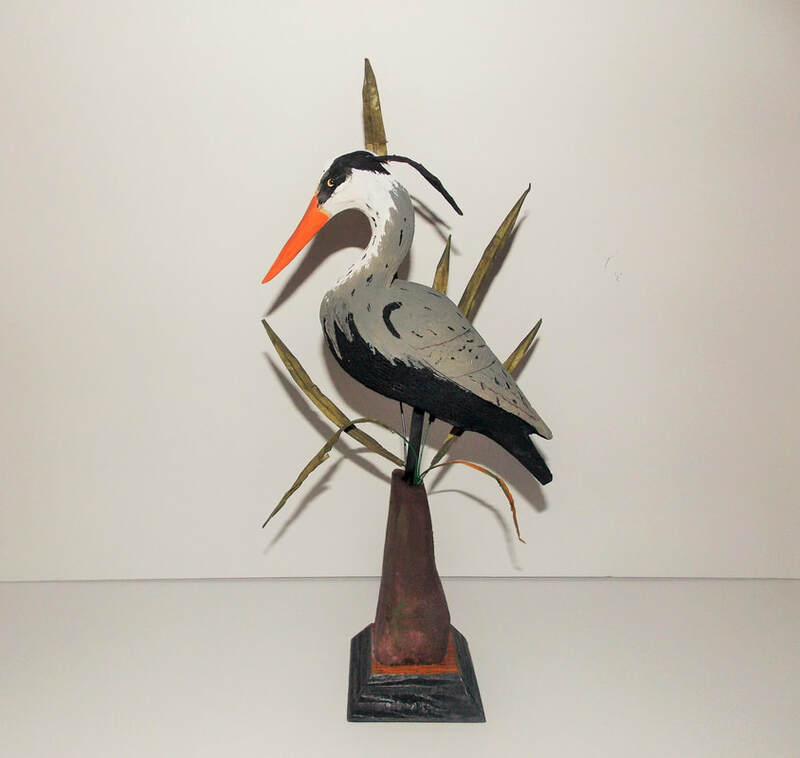 Herons are all 5 inches long - 1 inch wide - 3 inches high on stand . 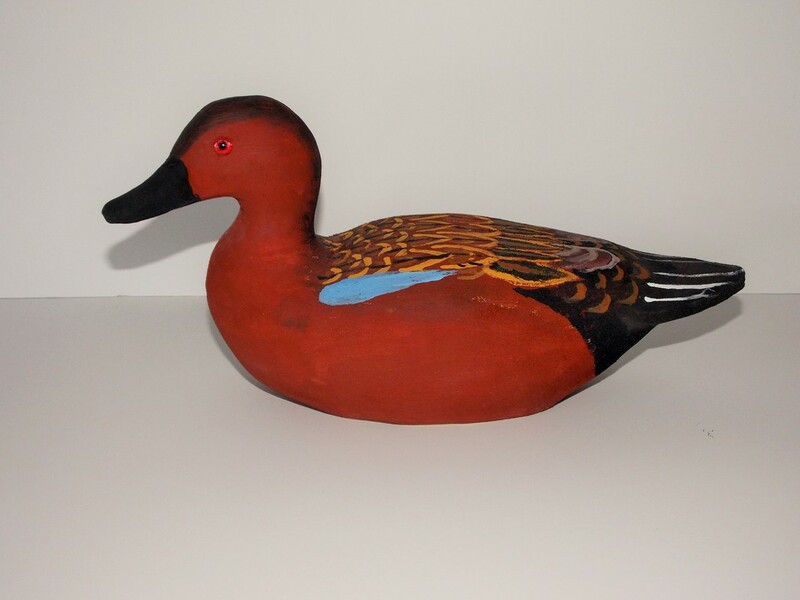 Miniature Blue wing teal is carved out of Balsa and painted in acrylics . Carving measures 7 inches long - 3 inches wide - 3 inches tall . 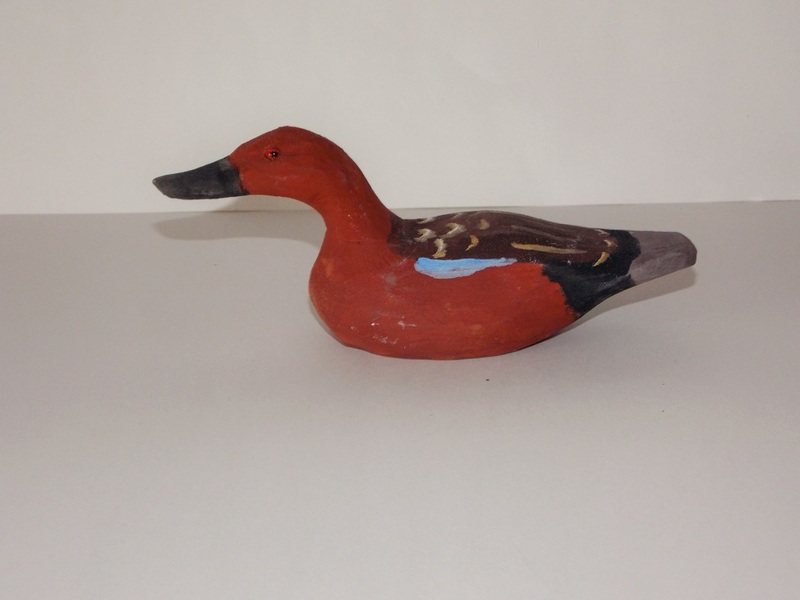 Cinnamon teal measures 7 1/4 inches long - 3 inches wide - 3 1/4 inches high . 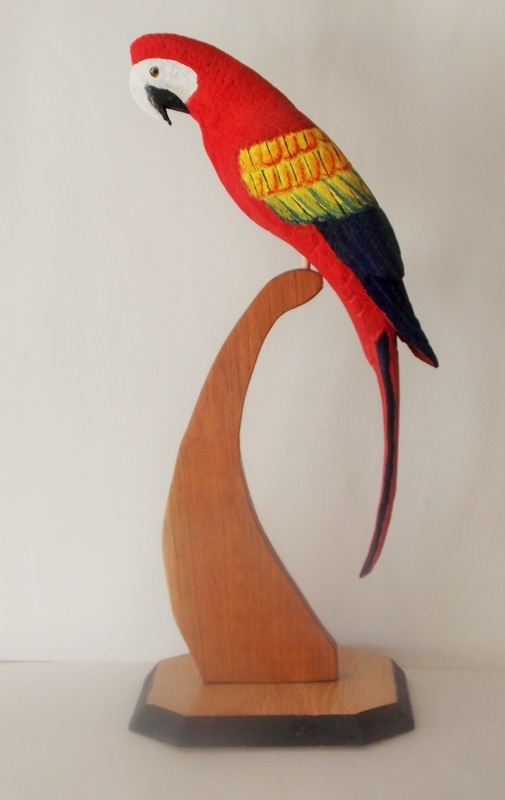 Miniature Ringneck measures 7 1/4 inches long - 3 inches wide - 3 1/2 inches high . 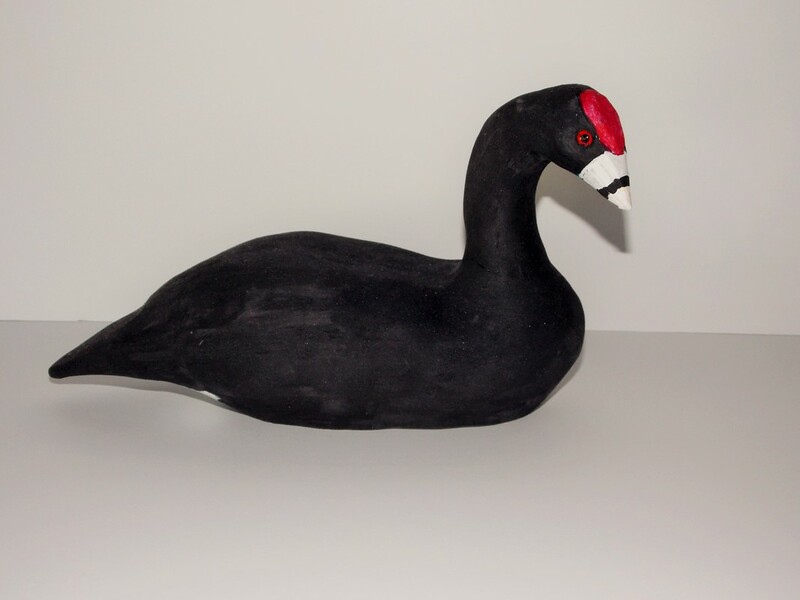 Carving is carved out of Balsa and painted in acrylics . 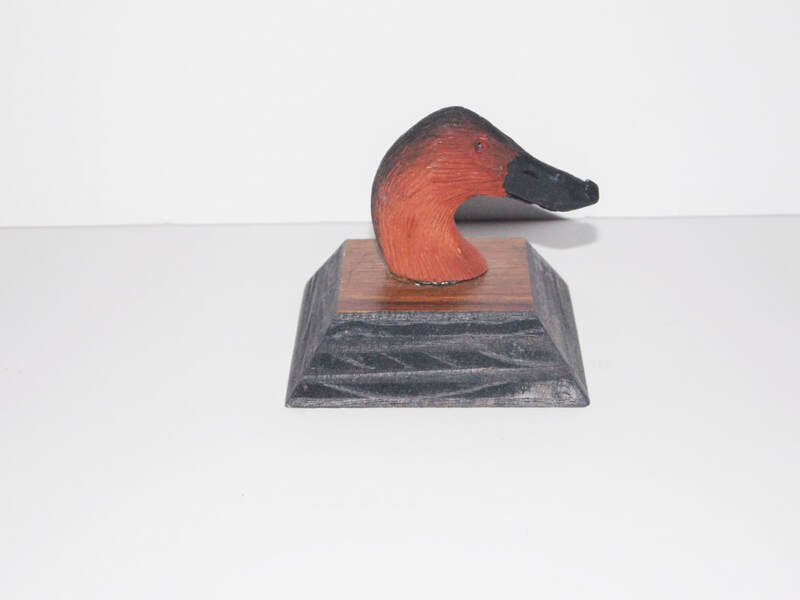 Miniature Canvasback measures 7 1/2 inches long - 3 inches wide - 3 1/2 inches high . 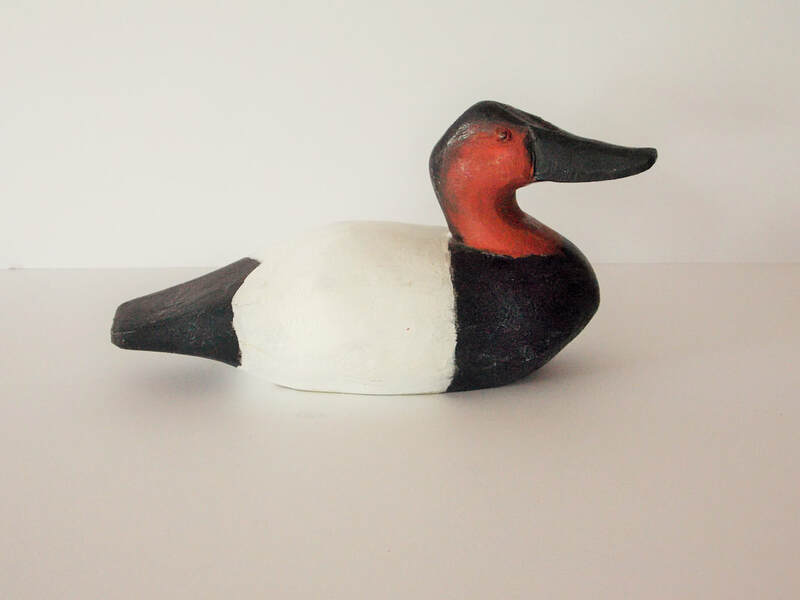 Miniature Canvasback is carved out of Balsa and painted in acrylics . 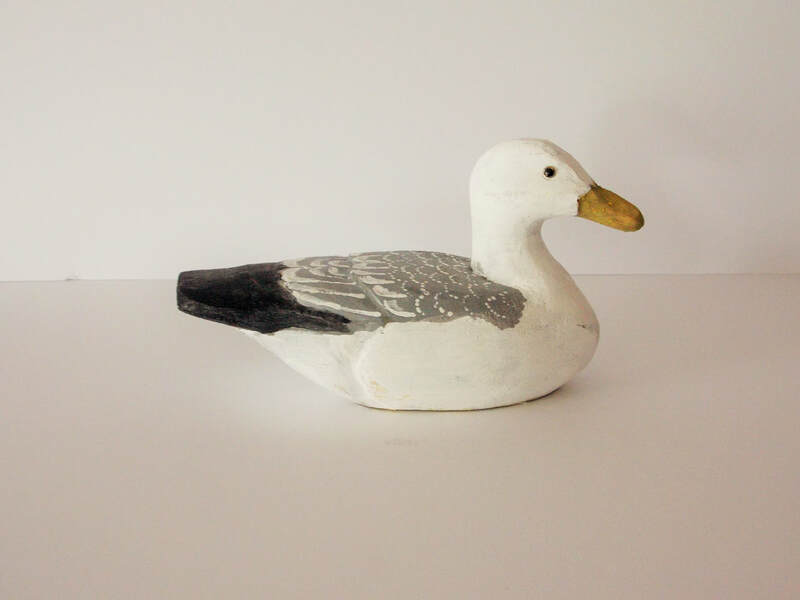 Miniature Mallard measures 7 1/2 inches long - 3 3/4 inches wide - 3 1/2 inches high . 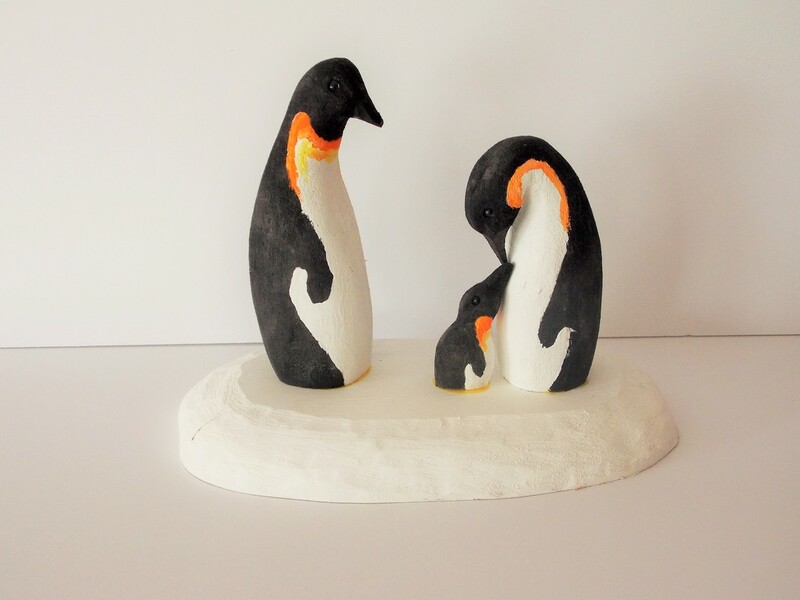 Carving is made out of Balsa and painted in acrylics . 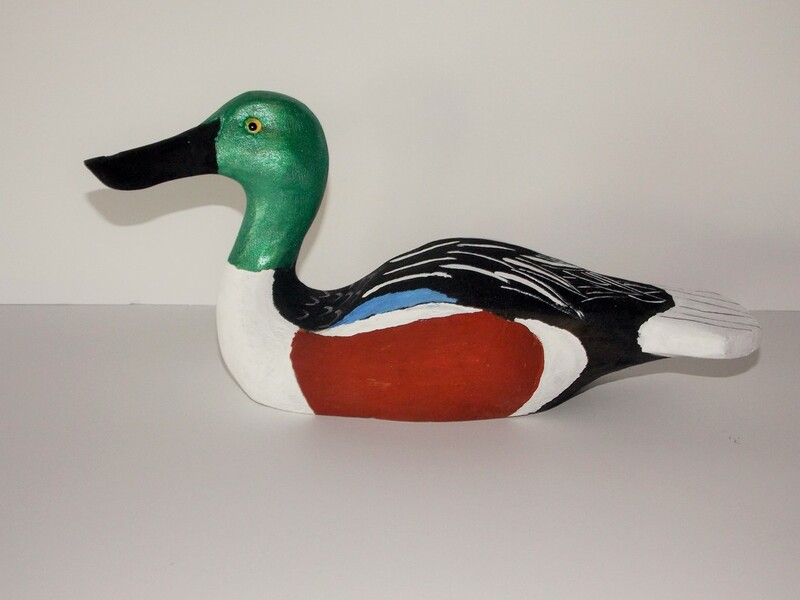 Miniature Pintail slick carved out of tupelo and painted in acrylics . Carving measures 8 1/4 inches long - 2 inches wide - 3 1/4 inches high . 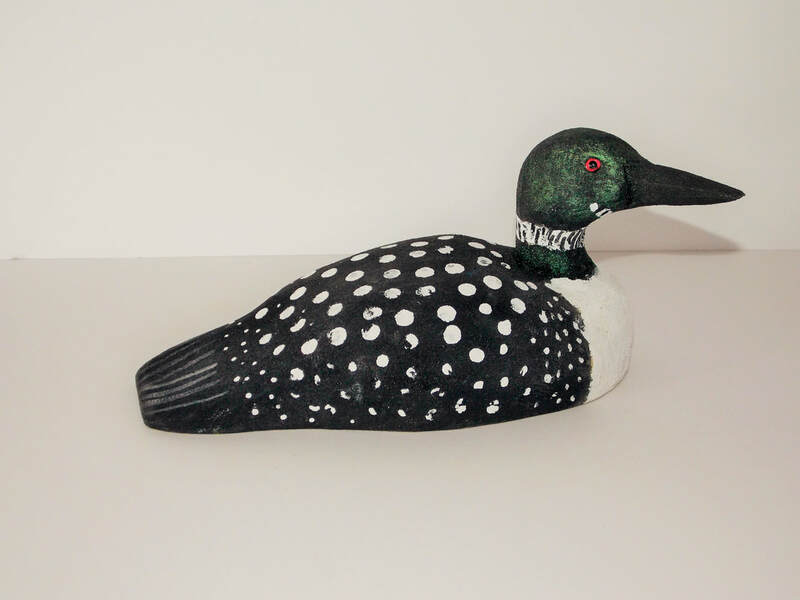 Miniature Loon carved out of Balsa and painted in acrylics . Carving measures 8 inches long - 3 inches wide - 3 inches high . 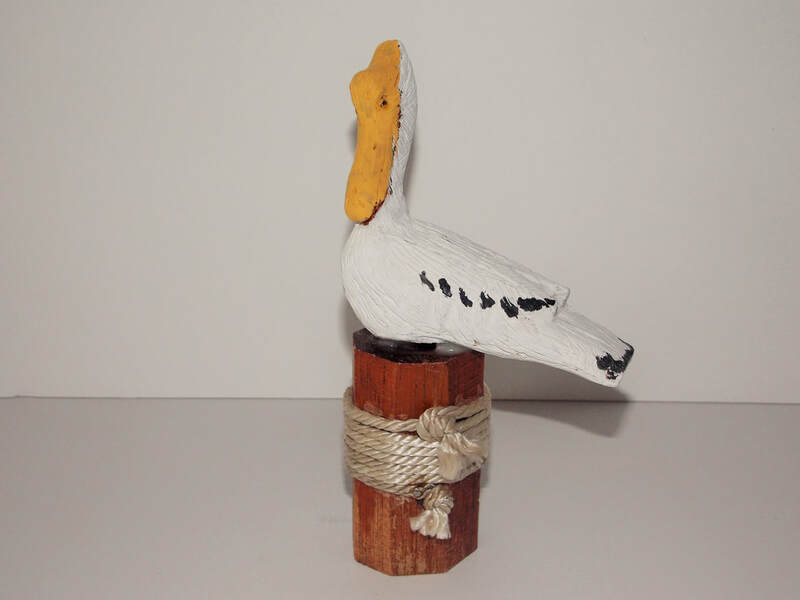 Miniature Sea Gull carved out of Balsa and painted in acrylics . Carving measures 6 3/4 inches long -2 1/2 inches wide - 3 1/2 inches high . 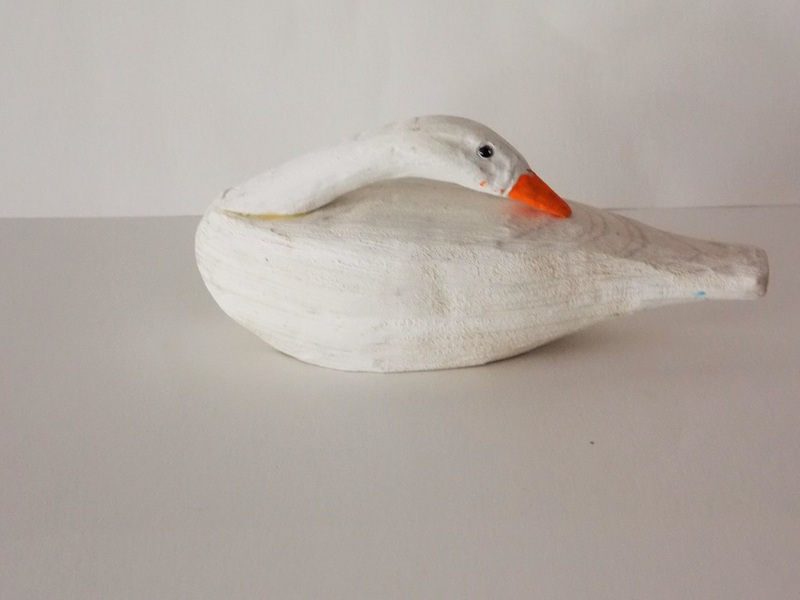 Miniature White Swan carved out of Walnut and painted in acrylics . Carving measures 8 inches long - 2 1/4 inches wide - 3 1/2 inches high . 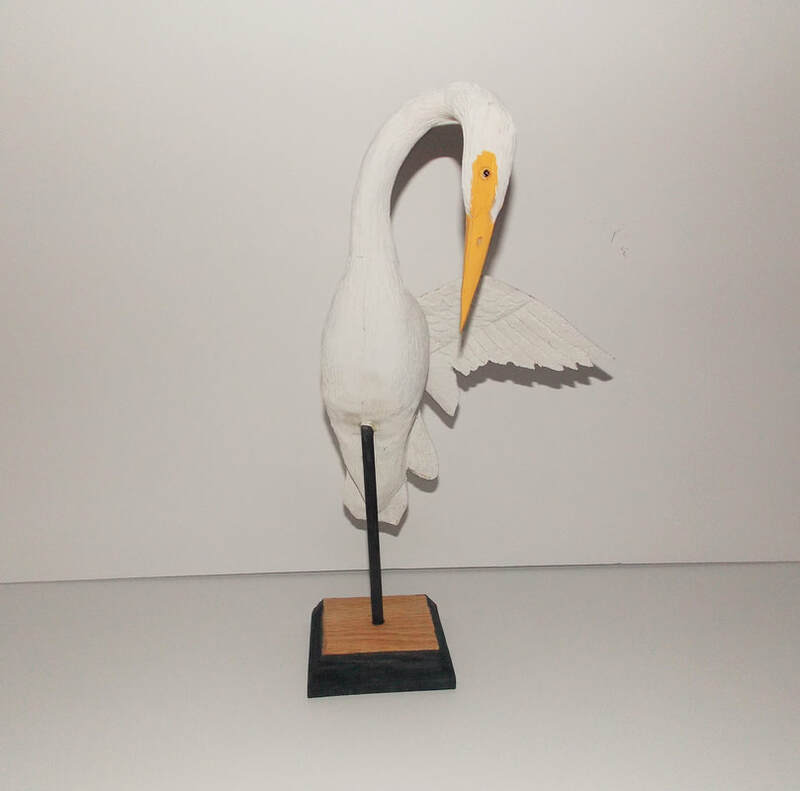 Miniature Spoonbill carved out of Balsa and painted in acrylics . Carving measures 8 1/2 inches long - 2 1/2 inches wide - 2 3/4 inches high . 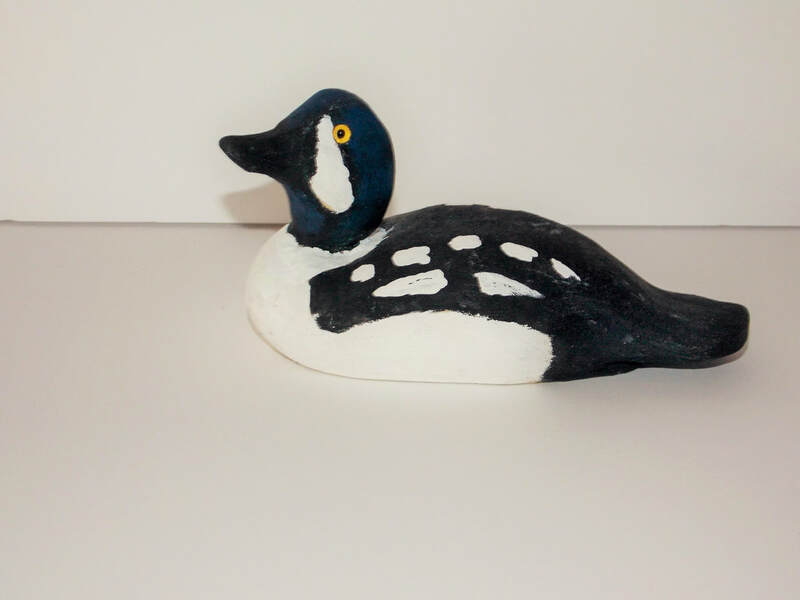 Miniature Hooded Merganser carved out of tupelo and painted in acrylics . Carving measures 5 inches long - 2 inches wide -2 3/4 inches high . 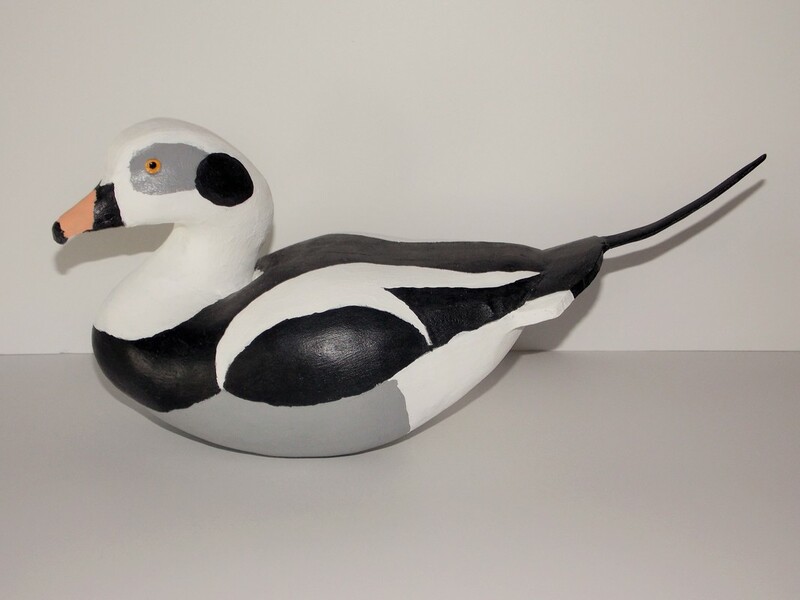 Hooded Merganser Hen Carved out of tupelo and painted in acrylics . Carving measures 6 1/2 inches long - 2 1/4 inches wide - 2 3/4 inches high . 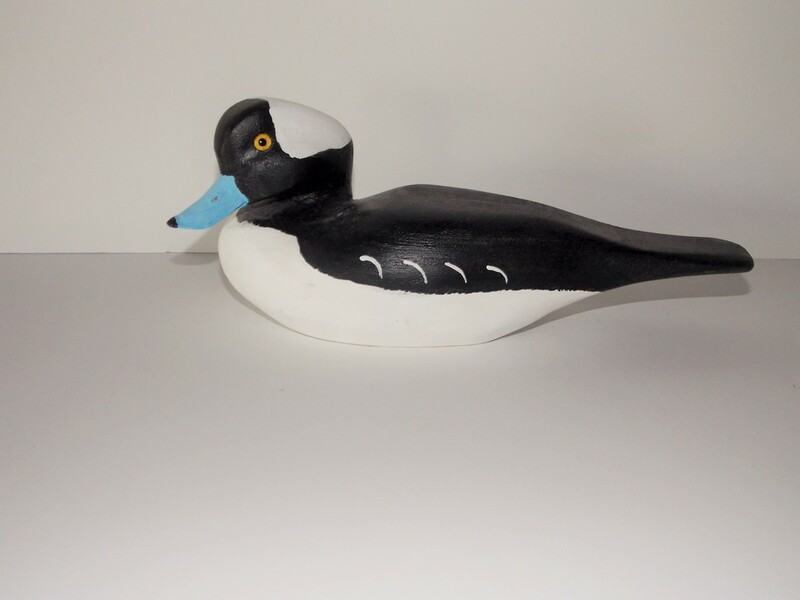 Miniature Goldeneye carved out of tupelo and painted in acrylics . Carving measures 5 1/2 inches long - 2 inches wide - 3 inches high . Carving measures 5 1/2 inches long - 2 inches wide - 2 3/4 inches high . 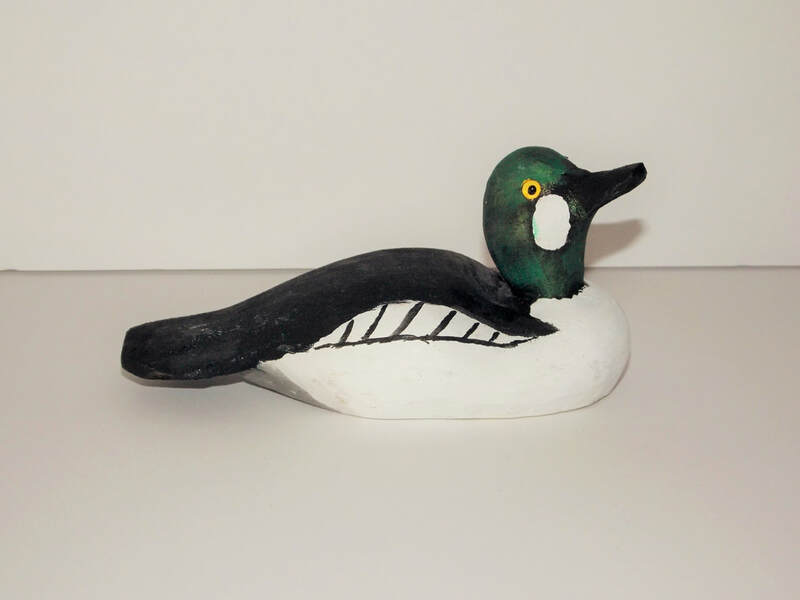 Miniature Barrows Goldeneye carved out of tupelo and painted in acrylics . Carving measures 6 inches long - 2 1/2 inches wide - 3 inches high . 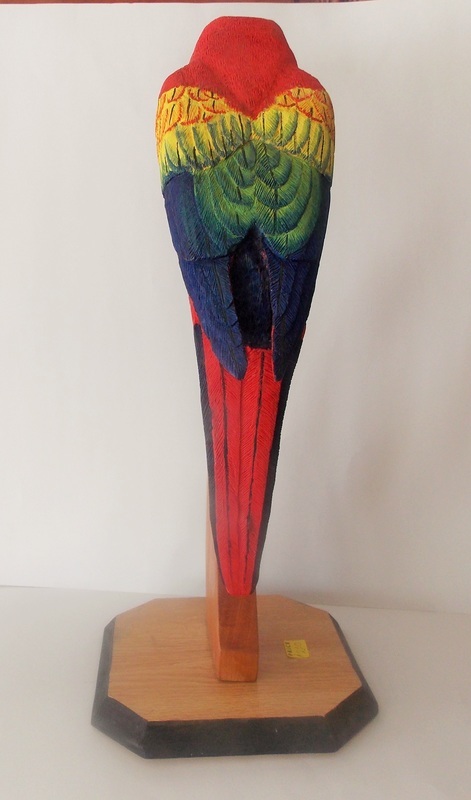 Miniature Ringneck carved out of tupelo and painted in acrylics . Carving measures 5 1/2 inches long - 2 1/4 inches wide - 2 1/2 inches high . 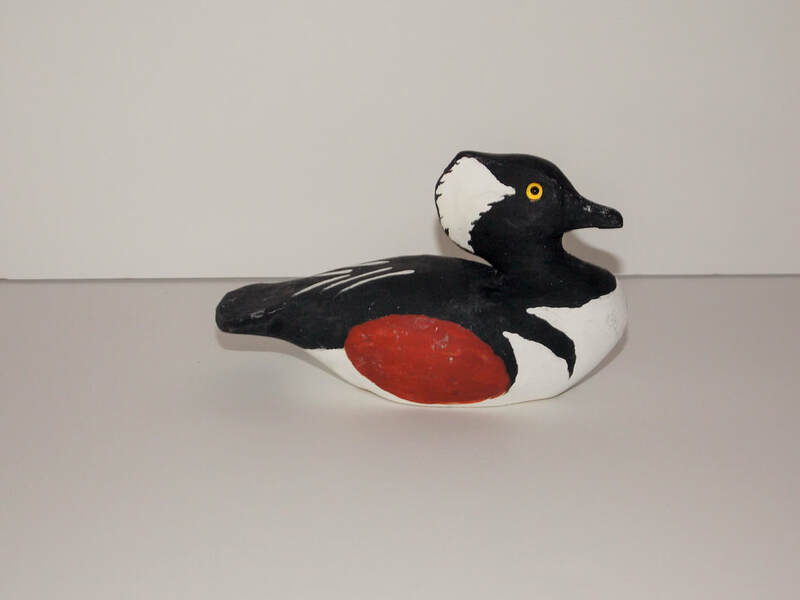 Miniature Red Breasted Merganser carved out of tupelo and painted in acrylics . Carving measures 7 1/2 inches long - 2 inches wide - 2 1/2 inches high . 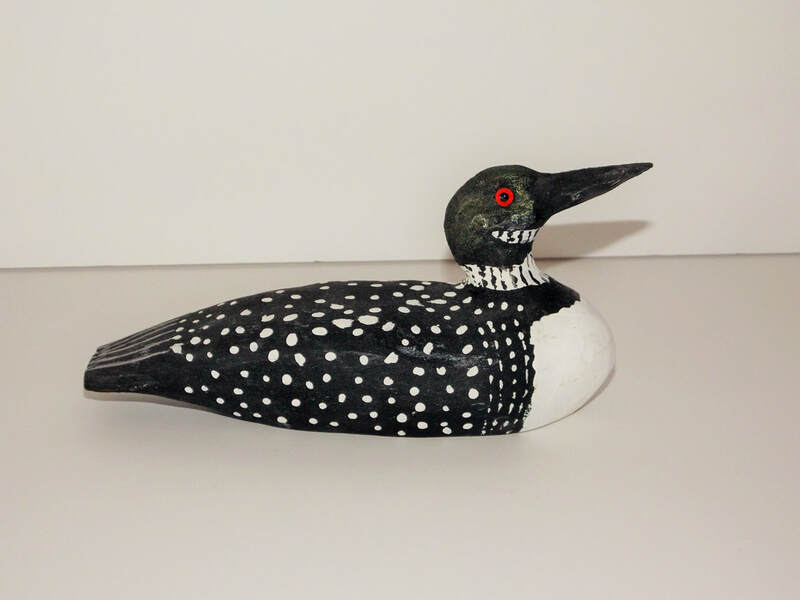 Miniature Loon carved out of tupelo and painted in acrylics . Carving measures 6 1/2 inches long - 2 inches wide - 1 3/4 inches high . 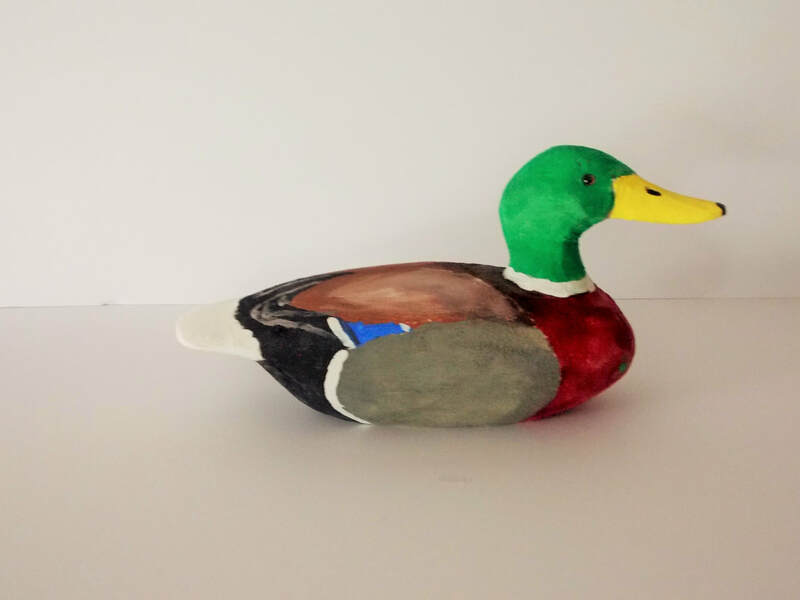 Miniature Mallard carved out of tupelo and painted with acrylics . 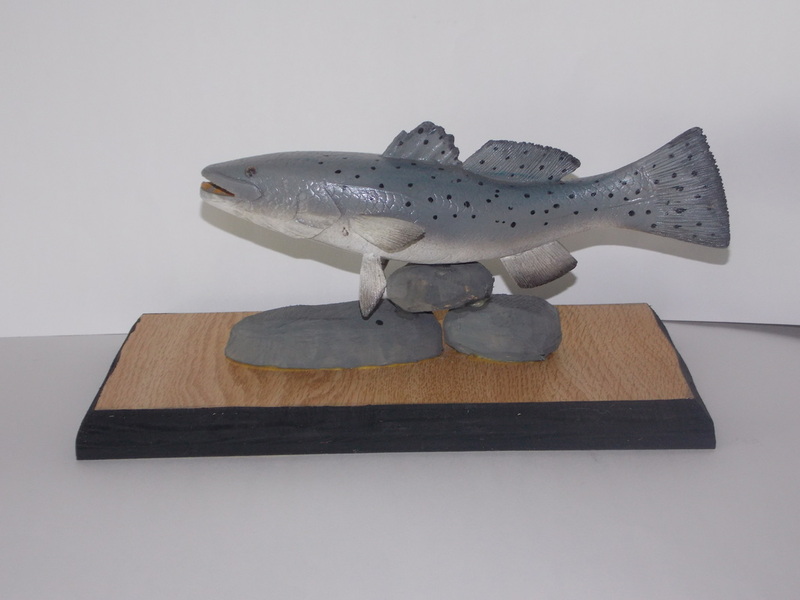 Yes it's new - new product added to my carvings for everyone to enjoy . 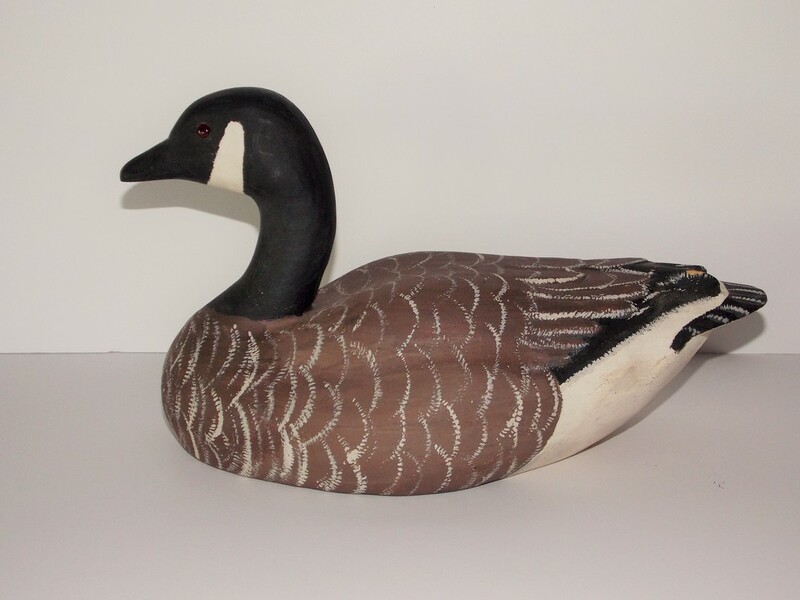 No decoy collection would ever be complete without having at least one of these . 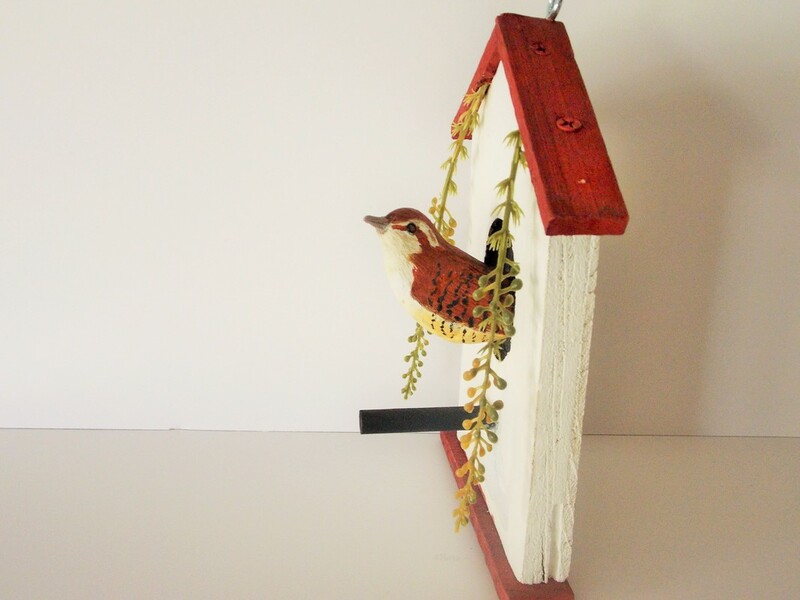 All hand carved, no two are alike - average 4 inches long - 1 3/4 inches wide - 2 inches high . 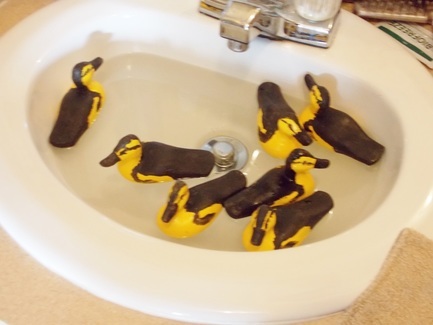 Besides getting attention from decoy collectors another advantage to these nice decoys are that Mom can put them in the bathtub for the kids to play with while taking their baths . You know how some kids are when you tell them it's bath time , you have to chase them all over the house because they don't want to get in the tub . 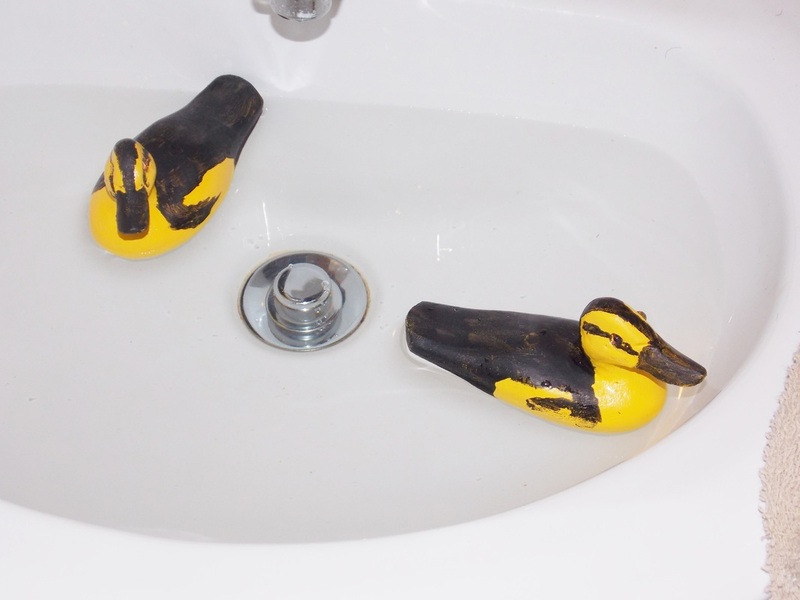 Problem solved , fill the tub with water and throw the baby bathtub decoy in the tub and tell them it's time for them to go play with their baby duck . Before you know it they will be coming to you asking if it is time to go play with the baby duck . They will love it . Carving measures 3 1/2 inches long - 2 1/2 inches high . 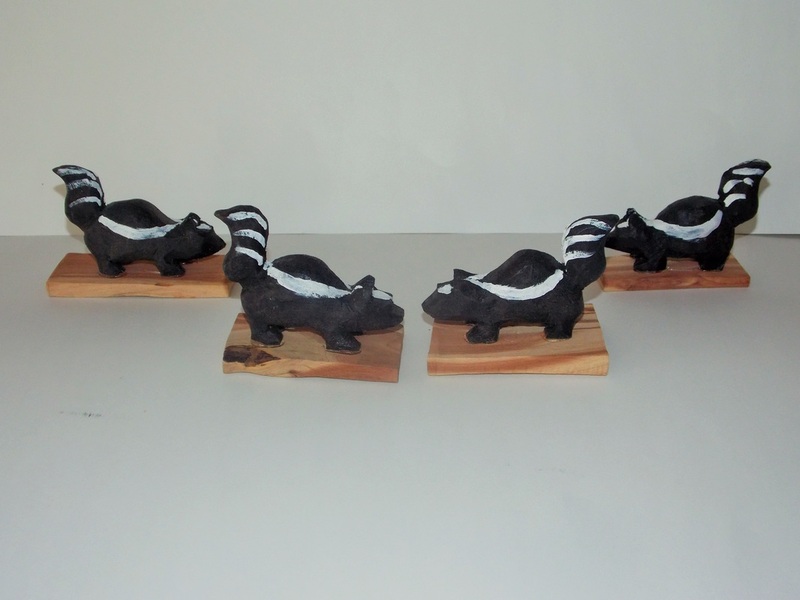 Hand carved Skunks - 3 1/2 inches long - 2 1/4 inches high . 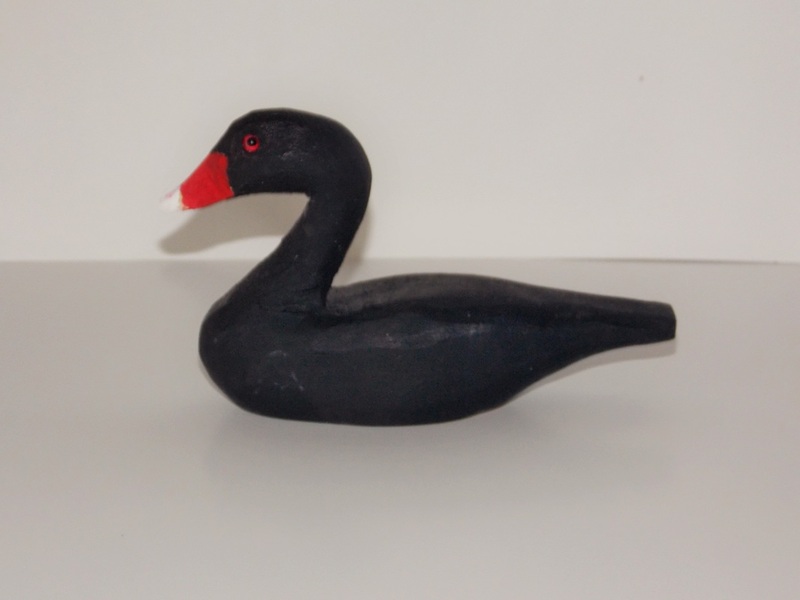 Black Swan - 5 inches long - 2 3/4 inches high . 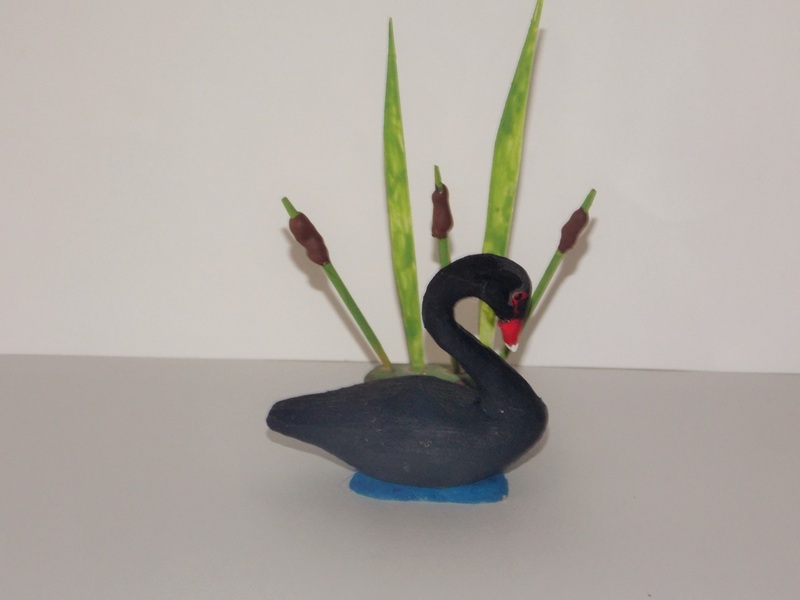 Miniature Black Swan carved in tupelo and painted in acrylics . Carving measures ​ 5 inches long - 2 3/4 inches high . Carving measures - 5 inches long - 1 1/2 inches wide - 2 inches high . Carving measures 2 3/4 inches long - 2 inches high - 4 inches high with grass in background . 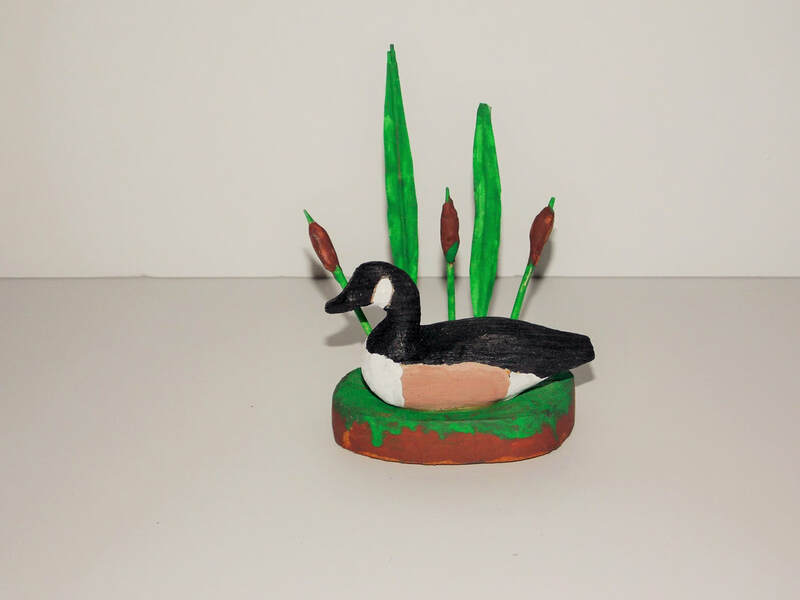 Miniature Canada Goose slick carved out of tupelo and painted in acrylics . 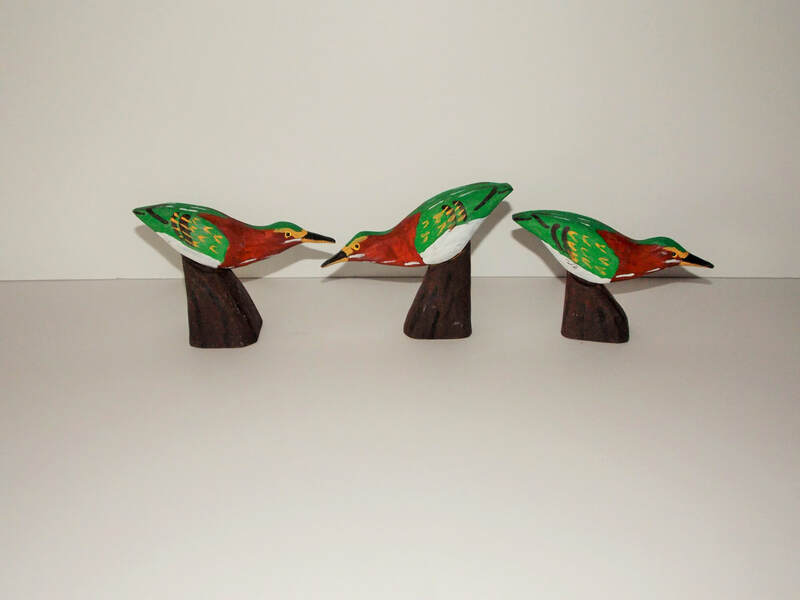 Carving measures 3 inches long - 1 1/4 inches wide - 1 3/4 inches high - 4 1/4 inches high with stand . 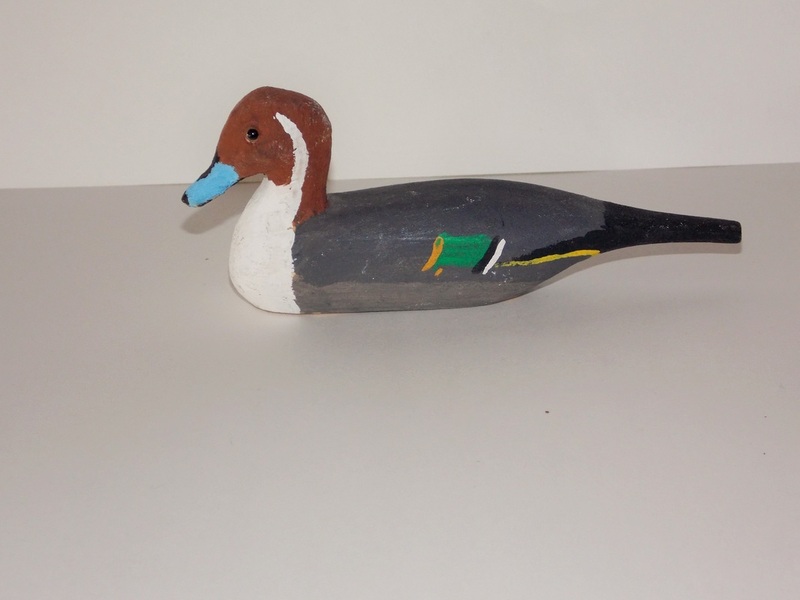 Miniature Canvasback is carved out of tupelo and painted in acrylics . Carving measures - 4 1/4 inches long - 1 3/4 inches wide - 1 3/4 inches high . 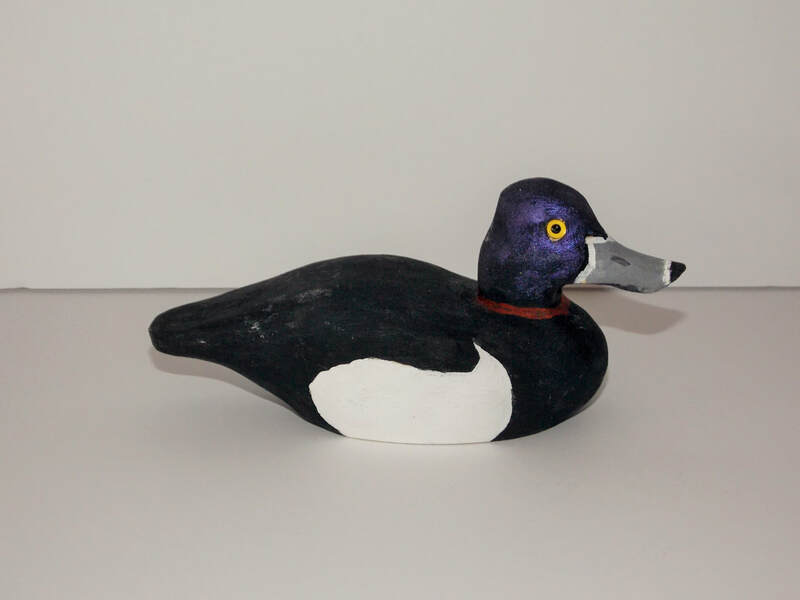 Miniature Scaup carved out of tupelo and painted in acrylics . 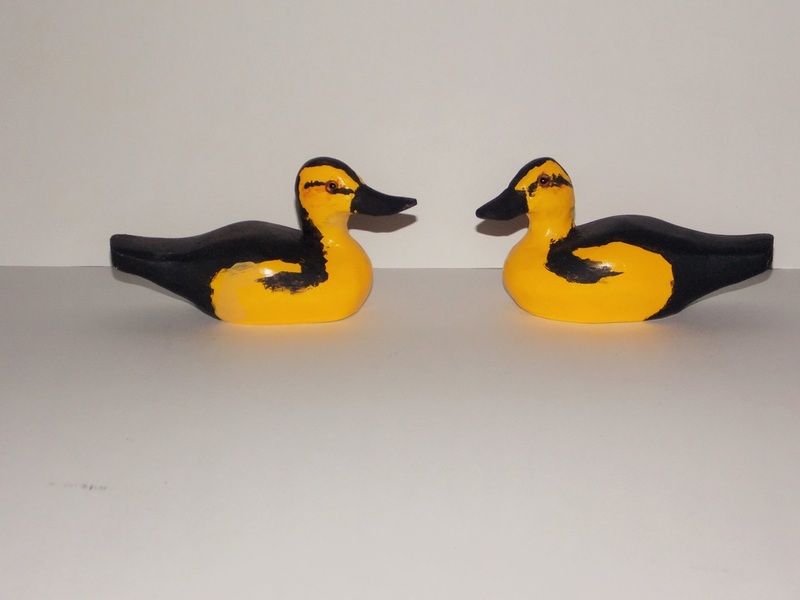 Carving measures - 4 3/4 inches long inches long - 1 1/2 inches wide - 2 1/4 inches high . 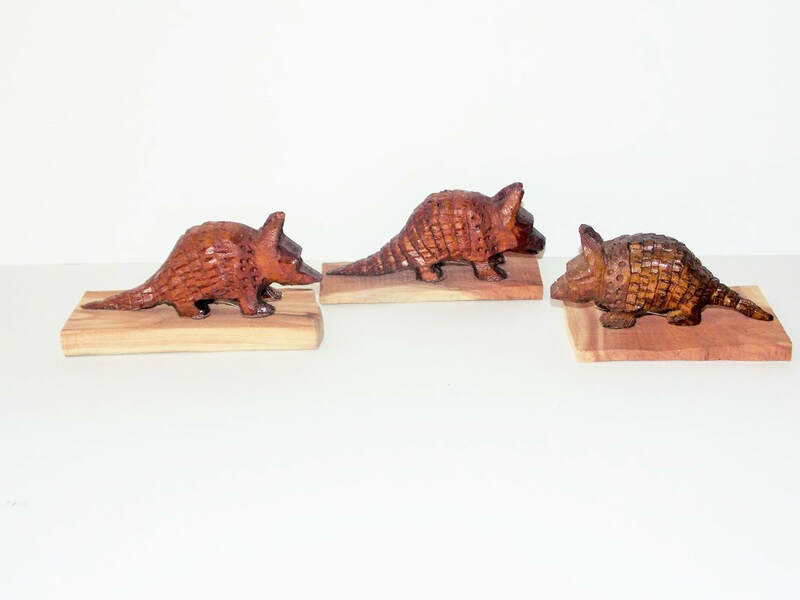 Carving measures - 4 inches long - 1 3/4 inches wide - 2 1/4 inches high . 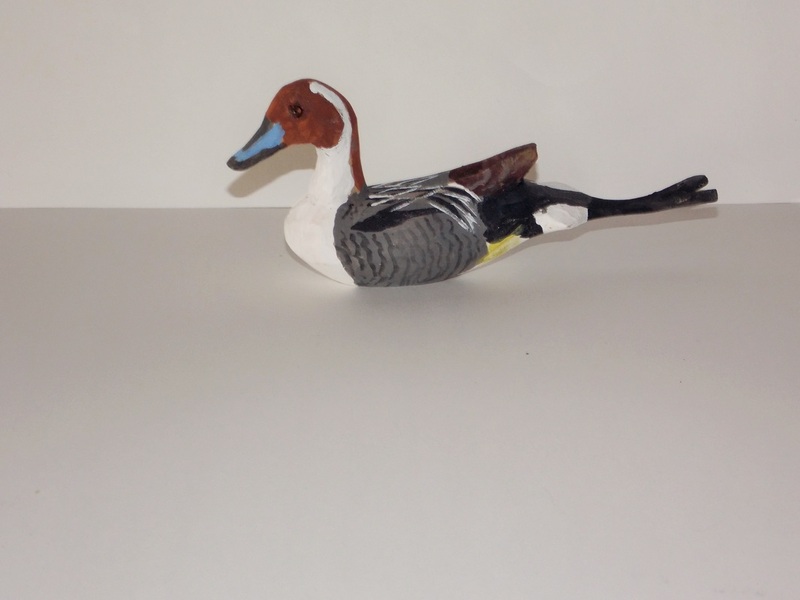 Miniature Pintail is carved out of tupelo and painted in acrylics . Carving measures - 4 3/4 inches long - 1 inch wide - 2 inches high . 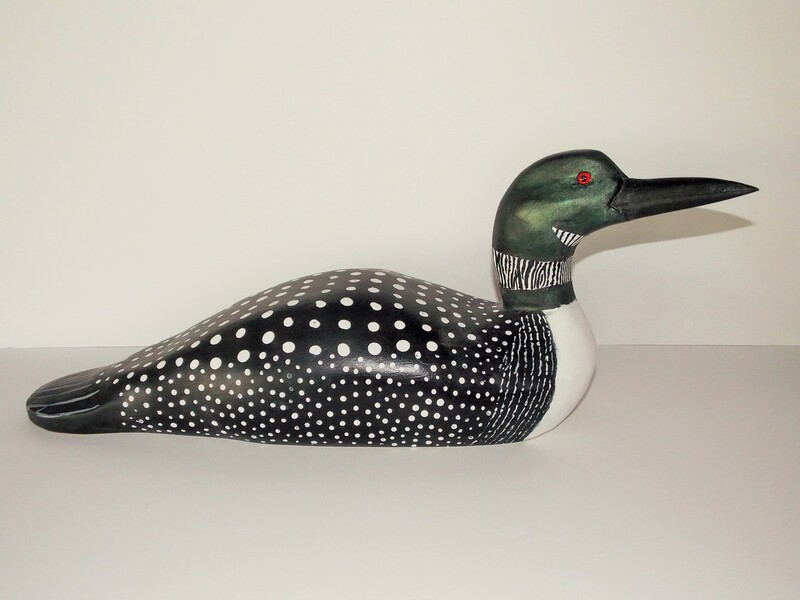 King Eider decoy - 4 1/2 inches long - 2 inches high . 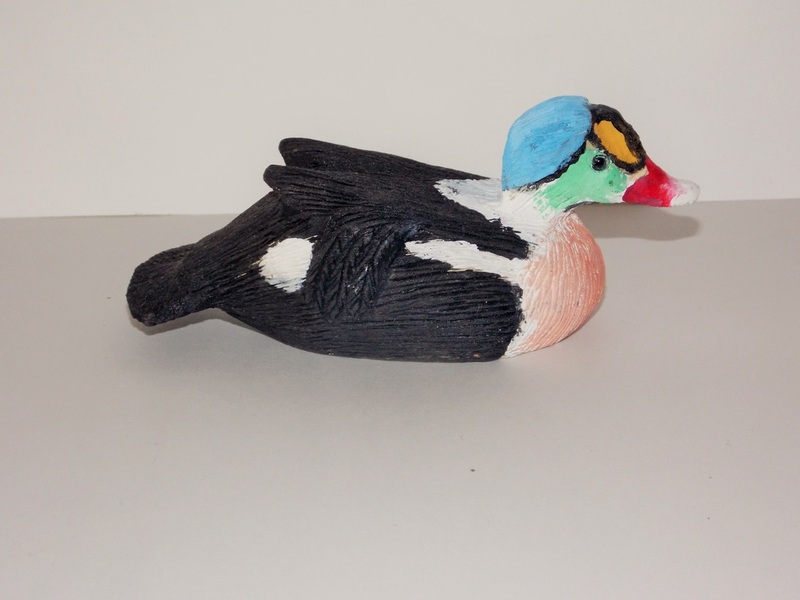 Miniature King Eider carved out of tupelo and painted in acrylics . 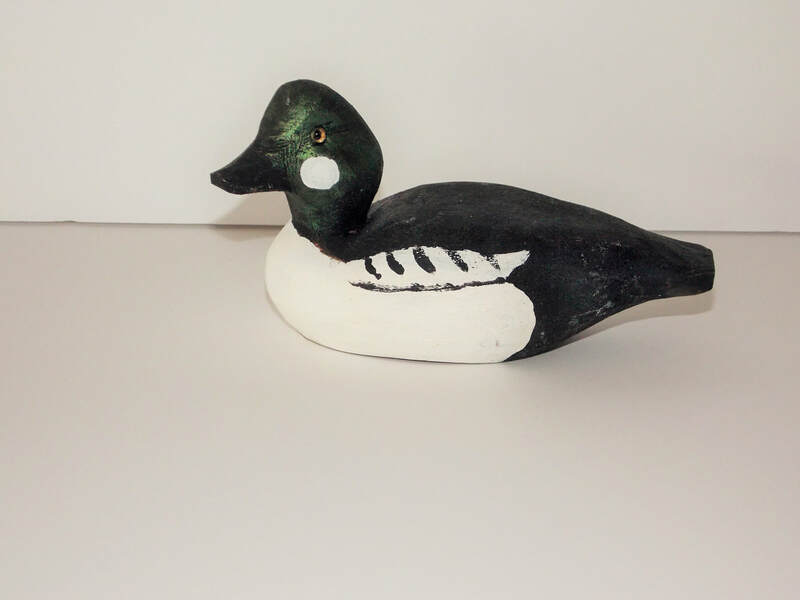 ​Carving measures 4 1/2 inches long - 1 1/2 inches wide - 2 inches high . 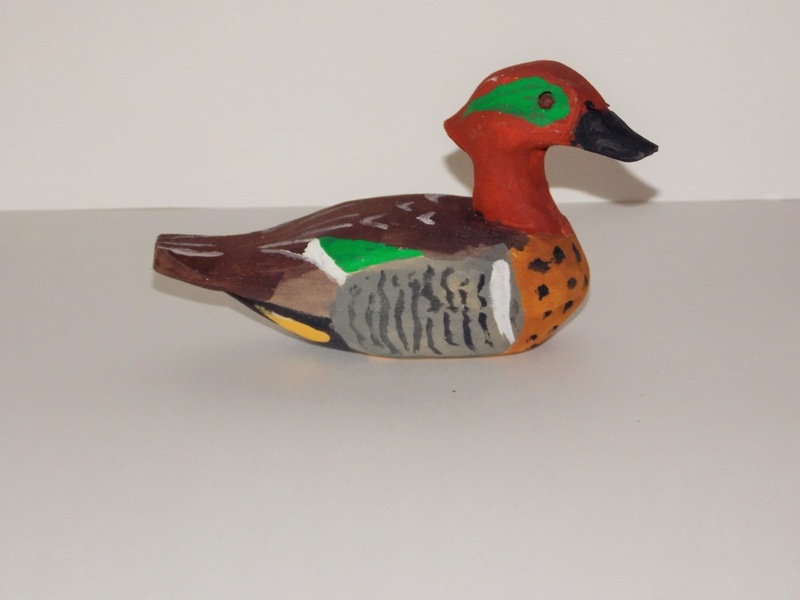 Miniature Green Wing Teal carved out of tupelo and painted in acrylics . Carving measures - 4 3/4 inches long - 1 1/2 inches wide - 2 1/2 inches high . 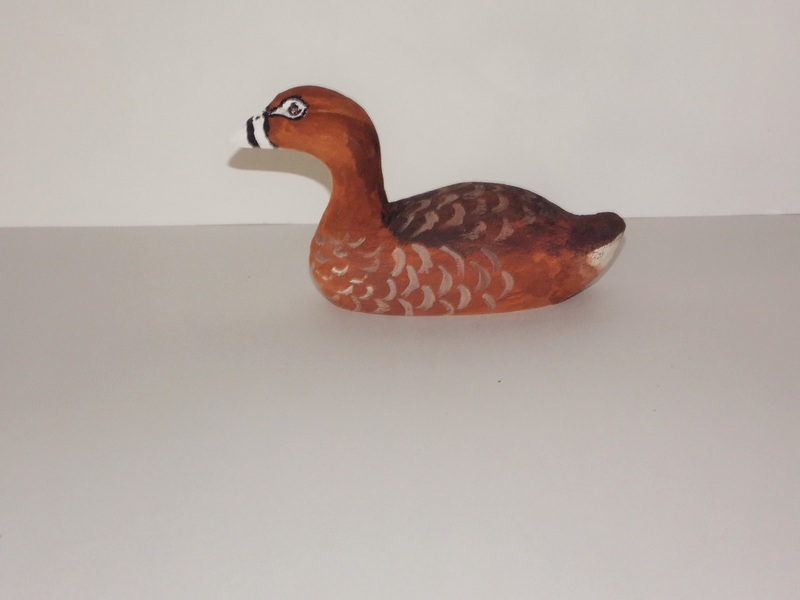 Miniature Pied-Billed Grebe carved out of tupelo and painted in acrylics . 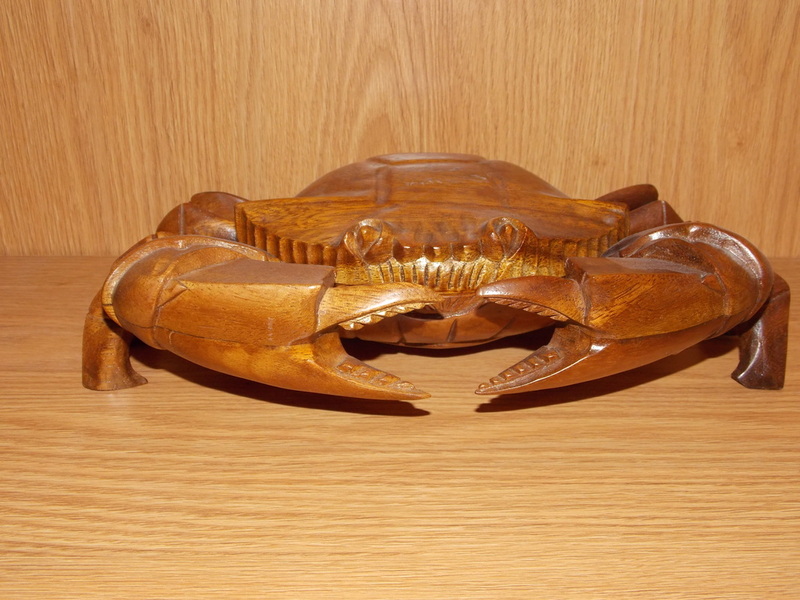 Carving measures - 4 1/2 inches long - 1 1/2 inches wide - 2 1/2 inches high . 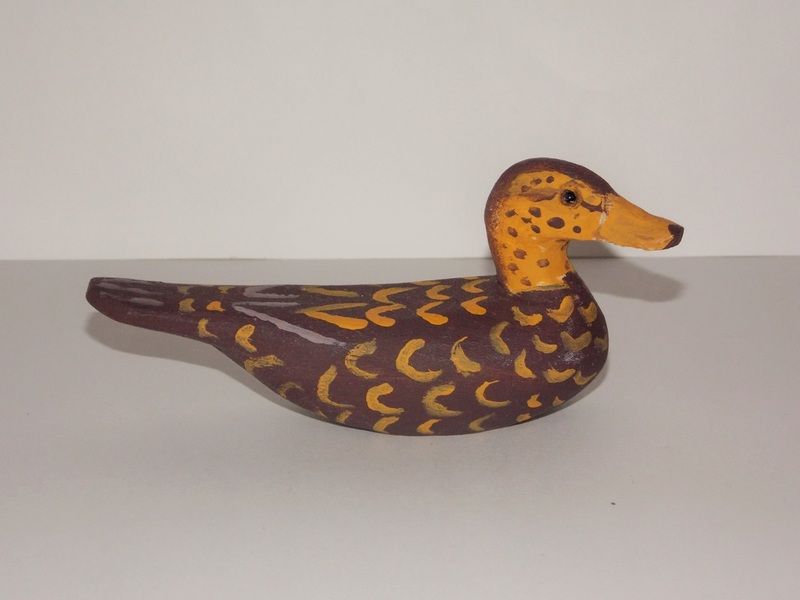 Miniature Black Duck carved out of tupelo and painted in acrylics . Carving measures - 4 1/2 inches long - 1 1/4 inches wide - 2 inches high . Carving measures - 5 3/4 inches long - 1 1/4 inches wide - 2 1/2 inches high . 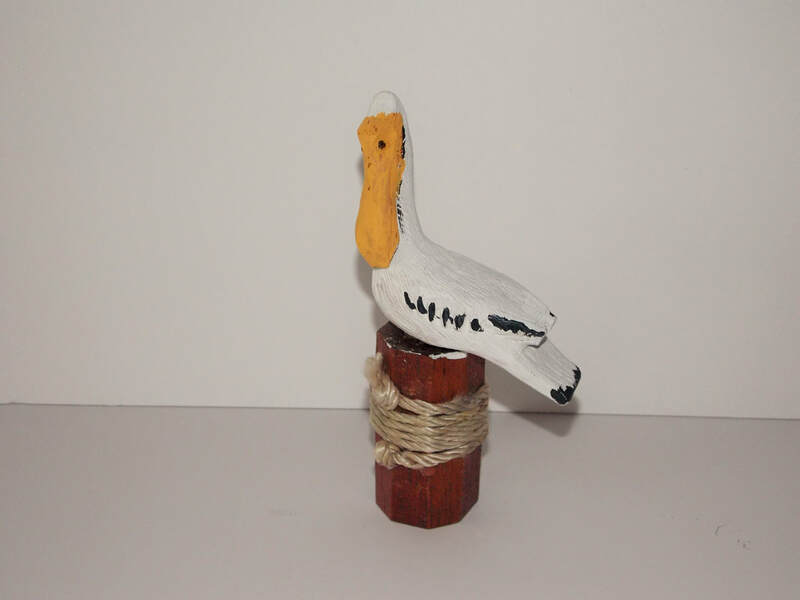 Miniature Old Squaw carved out of tupelo and painted in acrylics . 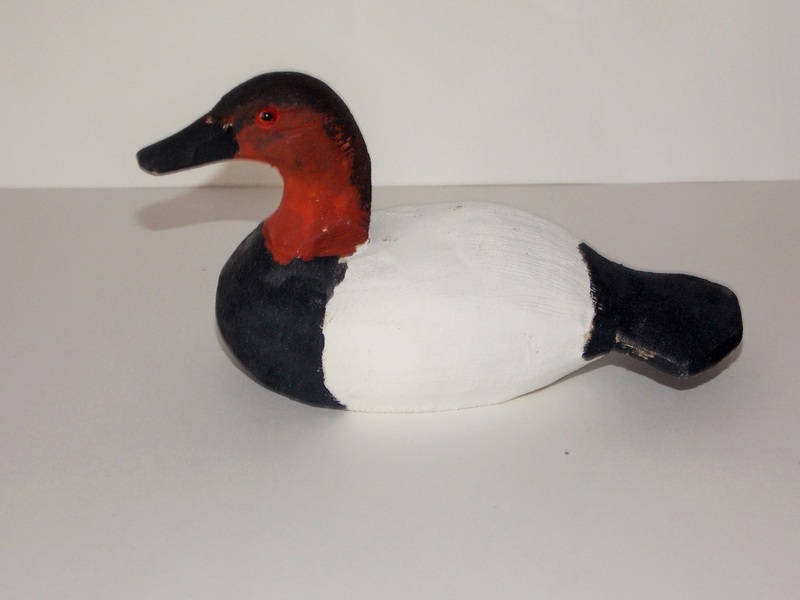 Canvasback - 4 3/4 inches long - 2 1/2 inches high . 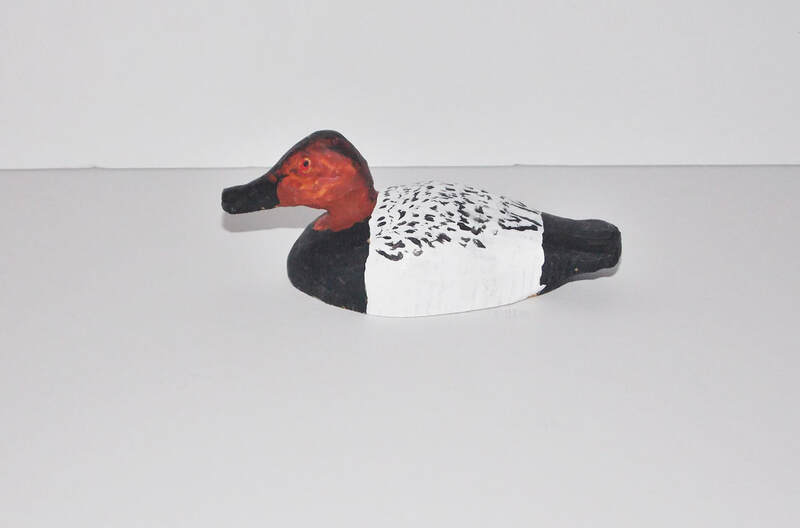 Miniature Canvasback carved out of tupelo and painted in acrylics . 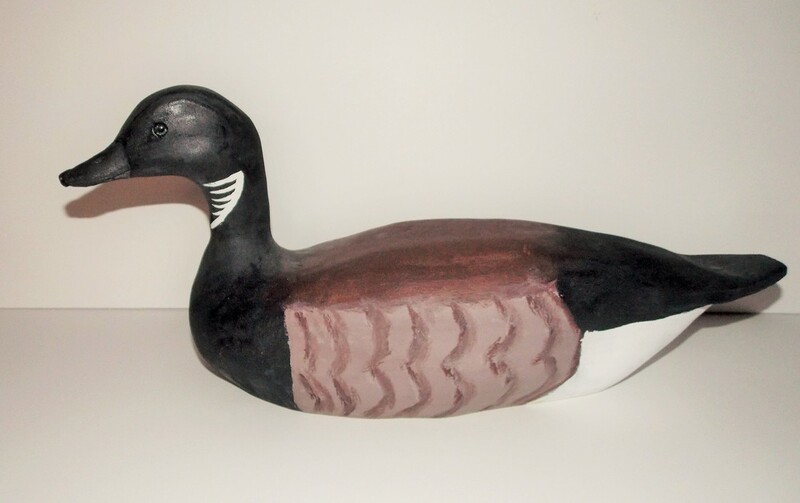 Carving measures - 4 3/4 inches long - 2 inches wide - 2 1/2 inches high . 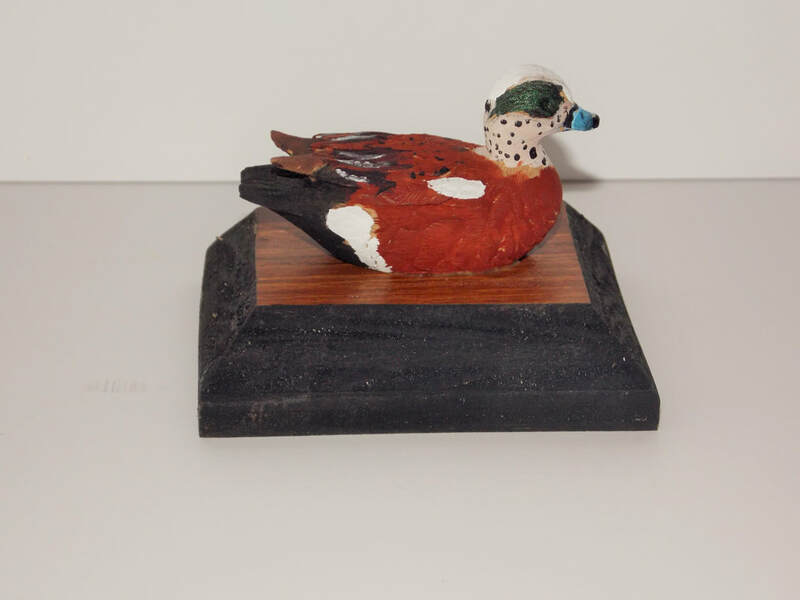 Miniature Cinnamon Teal is carved out of tupelo and painted in acrylics . Carving measures - 5 1/2 inches long - 1 1/2 inches wide - 2 1/4 inches high . 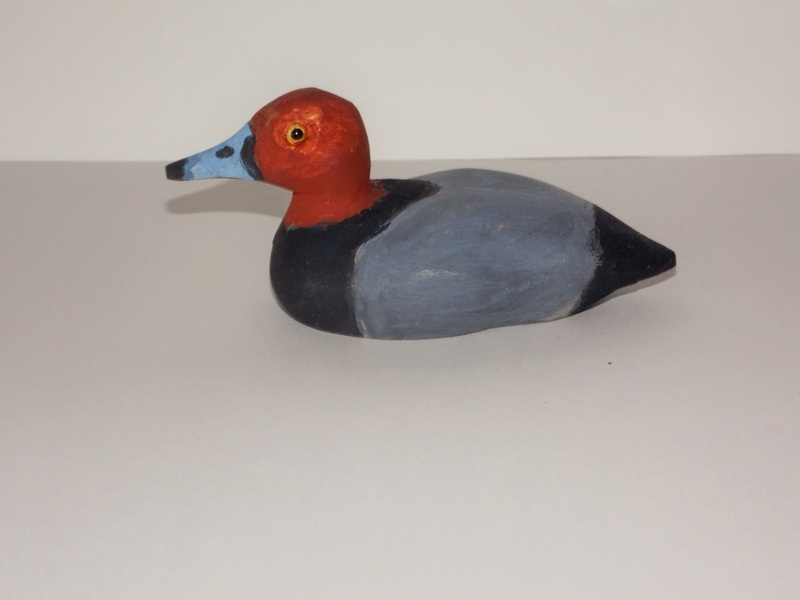 Redhead decoy - 4 1/2 inches long - 2 inches high . 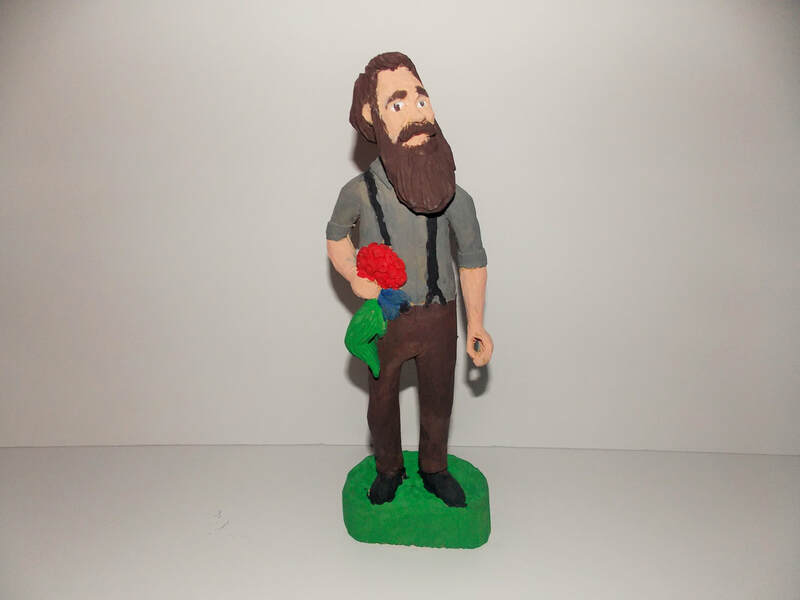 Miniature Redhead is carved out of tupelo and painted in acrylics . Carving measures 4 1/2 inches long - 2 inches wide - 2 inches high . 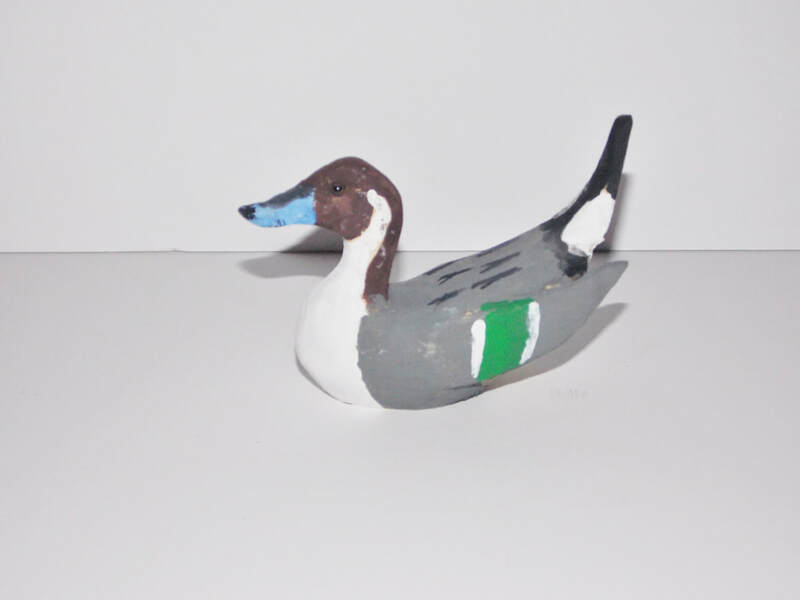 Miniature Pintail carved out of tupelo and painted in acrylics . 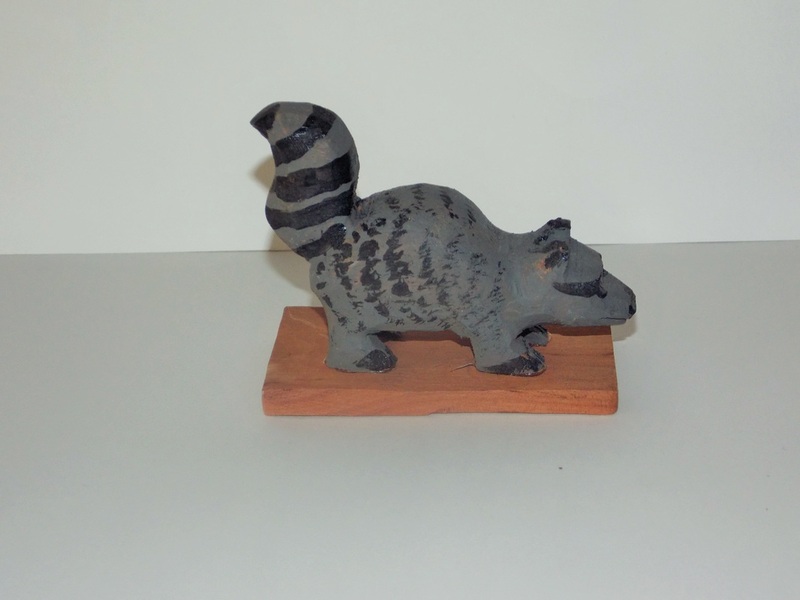 Carving measures 4 1/2 inches long - 1 1/2 inches wide - 3 inches high at tail . 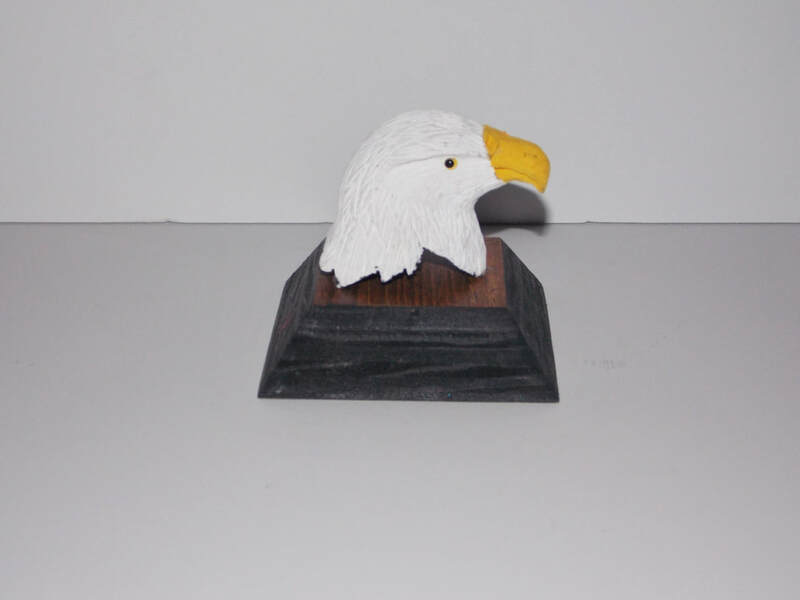 Miniature Eagle head carved out of tupelo and painted in acrylics . 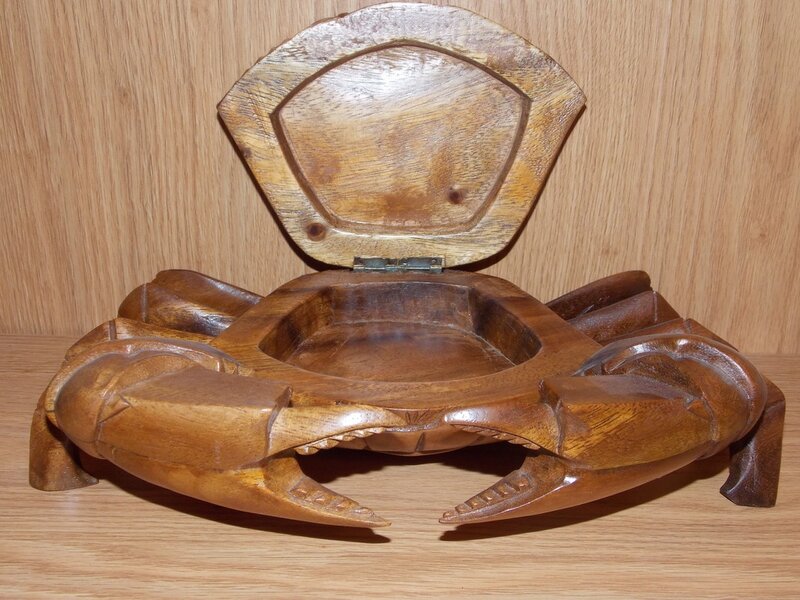 Carving measures 2 1/4 inches long - 1 1/2 inches wide - 2 1/4 inches high with stand . 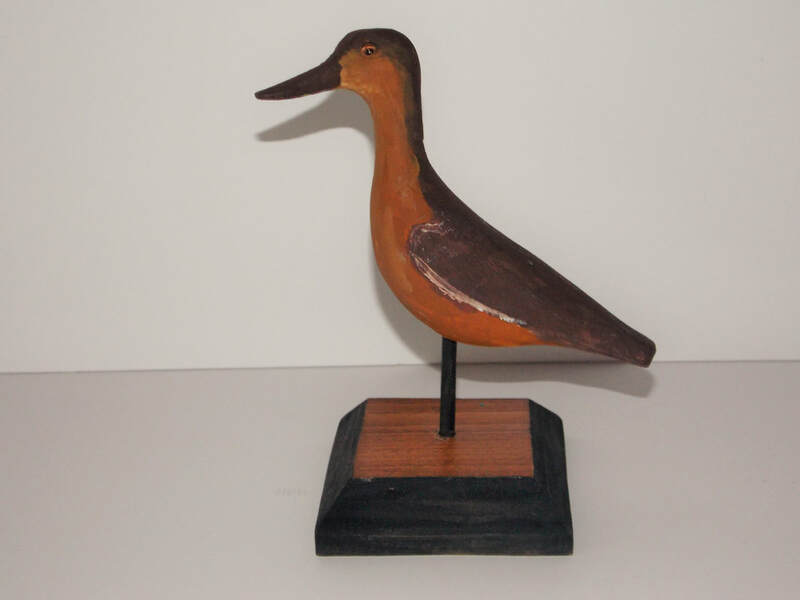 Miniature Canvasback head is carved out of tupelo and painted in acrylics . Carving measures 2 1/2 inches long - 1 inch wide - 2 1/2 inches high with stand . 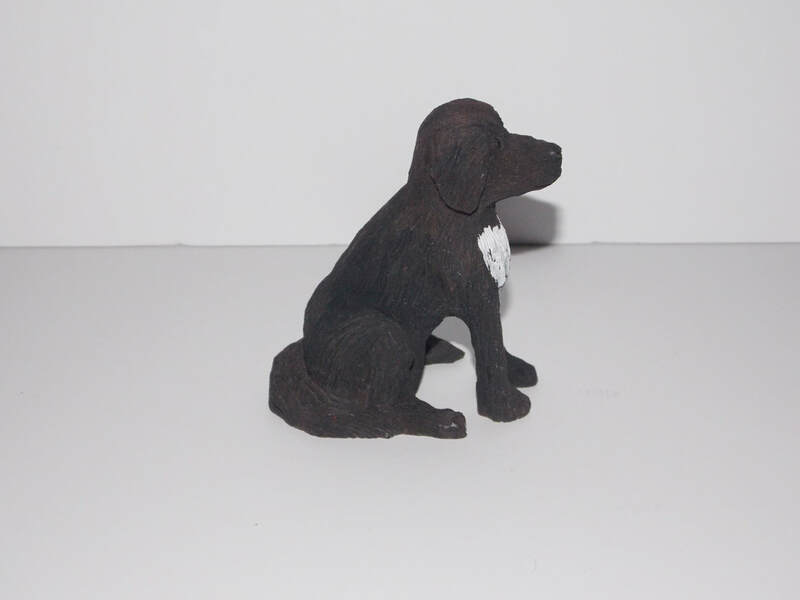 Miniature Dog carved out of tupelo and painted in acrylics . Carving measures 3 inches long - 2 inches wide - 3 inches high . Leave a comment or question and click on submit button and you are good to go .